Miss us? We miss you too. Come see us starting this Saturday at one of our two new markets, which go through the end of March! Building 41 of Reynolds Village at 40 North Merrimon Avenue, Asheville. We’re taking new customers for our February-April 2014 CSA season! More info and a sign up form are here. We offer home delivery! Signing up as early as possible really helps us plan, so please do! It also ensures you’ll get a spot in the CSA, which tends to fill up quickly! Happy New Year! 2014 sure made an awesome entrance! Winter on a farm presents some challenges. And zero degree temperatures cause some stress all around, for us and for the animals! Having 50-gallon troughs of water freeze through is never fun… having your well freeze is even less fun. But we made it through and all the animals did too! Quite a bit’s changed since my last newsletter. In the interest of your time, I’ll illustrate those things with pictures. Shoulder-deep grass for finishing lambs! 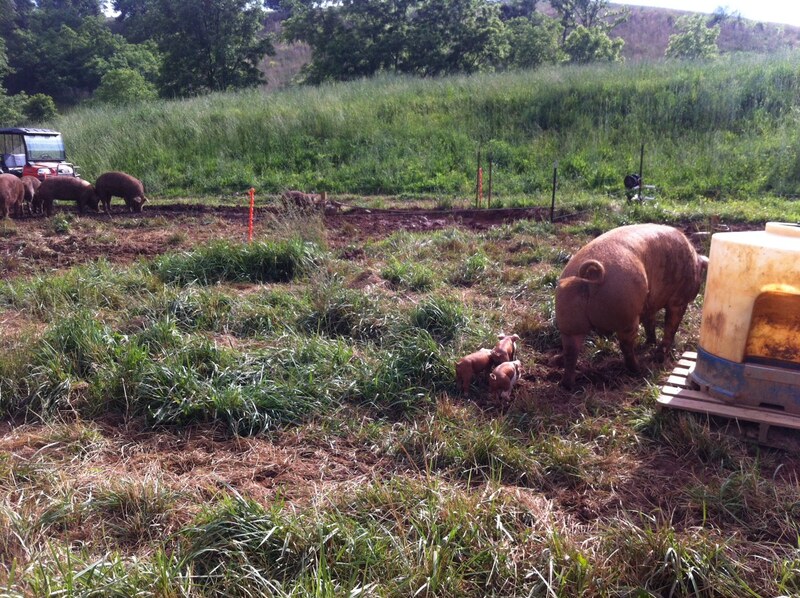 We moved the last of one batch of hogs off their field and planted it with oats. 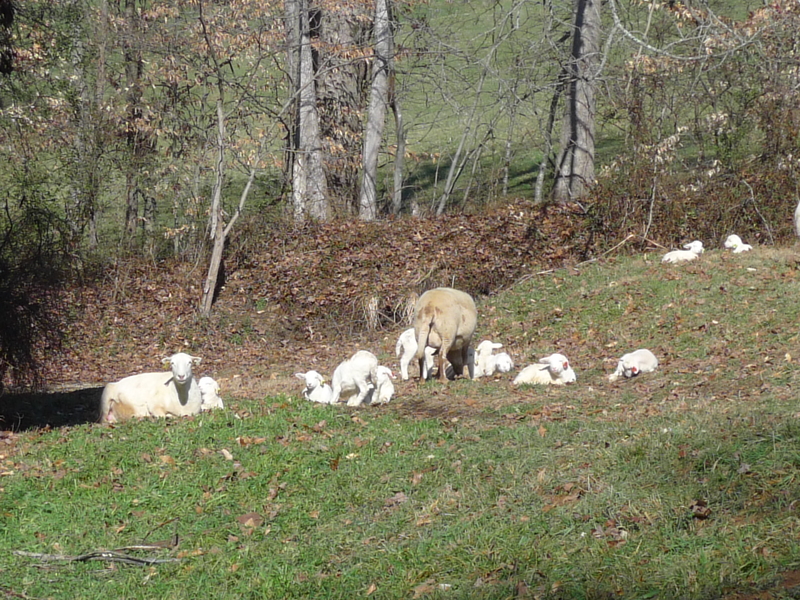 About six weeks later, the last 20 lambs had their final feast for two weeks. Finishing them on such lush grass makes for some amazing meat, so come buy some and taste the difference. Our plan is to continue seeding pastures behind the hogs to pull up some of that excess nitrogen and phosphorous and to fatten up our lambs in their last few weeks. I’ve included the last picture to illustrate how well our pastures bounce back, even when a rainy July means that the pigs do an excellent job tearing it up! 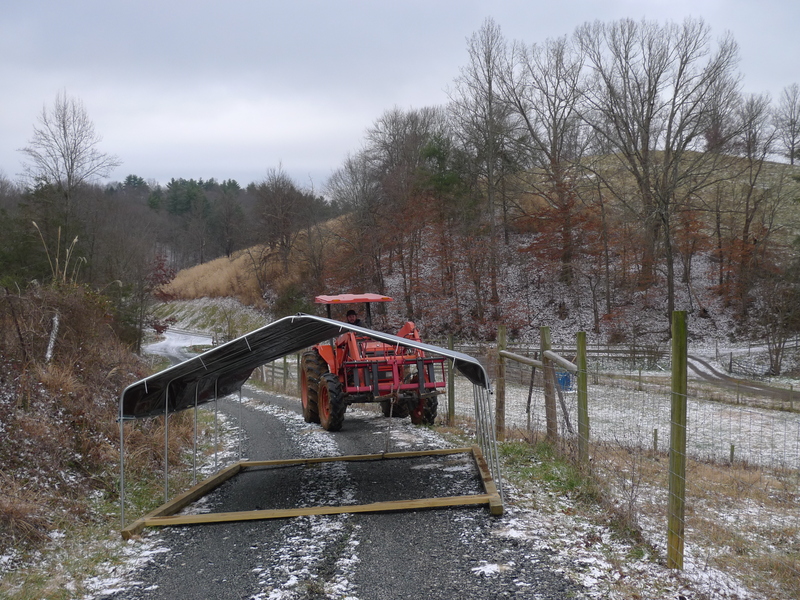 Not the best picture, but all those wooden posts on the right side of the driveway are new, and now we have a new 2,000 foot long stretch of fence that will keep the sheep on the road when we move them, and in the right field when we don’t want them to move! The pigs are back in the barn. We have our 17 breeders in our big (7,500 square foot) metal barn, with lots of straw to root in and big communal pens so they don’t get lonely. This barn has big sliding windows and doors. We were happy they were in here when that arctic front came through. The barn stayed at about 25 degrees when it was below zero outside, which likely kept our eleven six-week-old pigs alive! Dry, warm, happy pigs! Our truck turned 200,000 miles old! Happy mile-stone, truck! What happens when you have a very rainy, exhausting market and put a cooler full of eggs in the freezer instead of the fridge? Hoggy heaven! 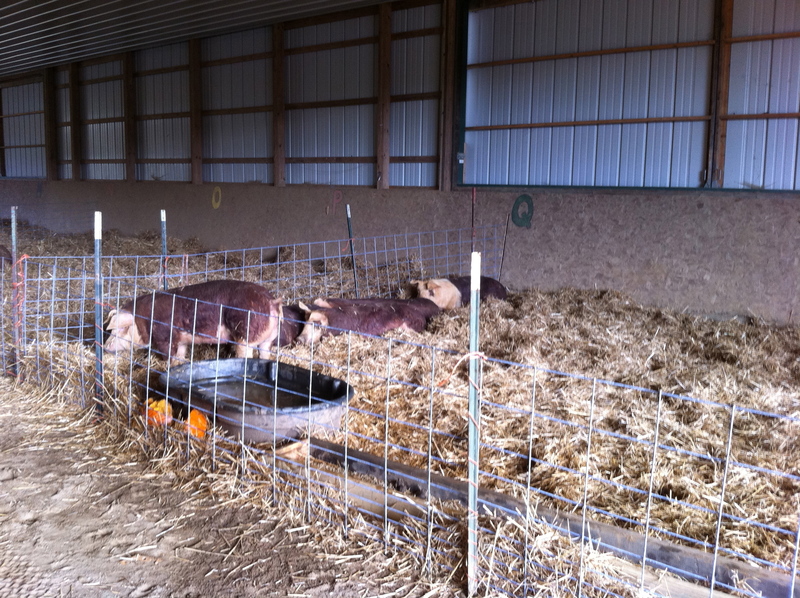 These growing pigs will be in these winter quarters until they go to market in February. They’ve got a big building to go into for shelter and a nice outdoor spot in which to root and sunbathe and cement spots for feeding. Happy pigs! I’ll take more pictures through this month. That’s it for now. Happy New Year everybody! Asheville City Market Downtown… Here we come! Asheville City Market – Downtown… here we come! Big news y’all! Starting THIS Saturday, you can find Graham and I and all of our Dry Ridge Farm products at Asheville City Market on Charlotte Street! Yippee! Being able to participate in this market is a bit of a game-changer for us, and it couldn’t come at a better time! With 30 lambs just about ready to go to market, and exactly 50 little pigs scampering through our pastures (that’s more than we’ve processed total to date! 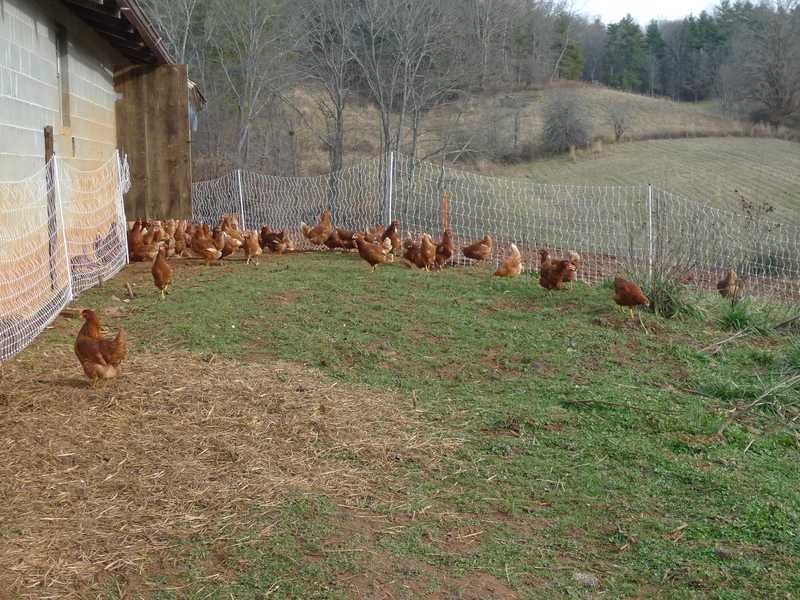 ), and 400 new laying hens in our brooder (which will double our flock), we’re ready to keep your breakfast, lunch, and dinner plates full of delicious Dry Ridge Farm meat and eggs! Getting to become a part of your weekend routine stroll through Asheville’s best farmer’s market is delightful! Thanks for all your support through our first year and a half! It’s your support that’s made us able to offer our products at this Saturday market, and we’re looking forward to offering more and more delicious food for you! 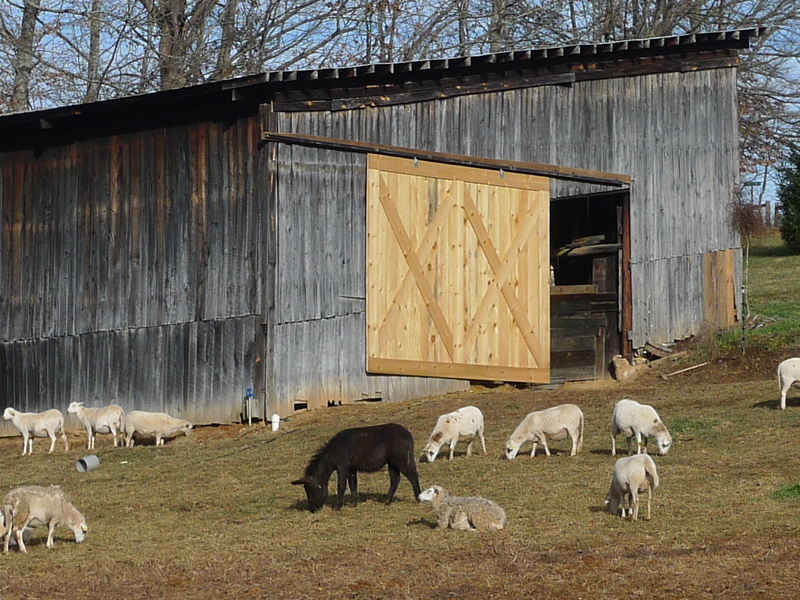 For this one weekend, from 1-6pm both days, 31 farms in Western NC, including Dry Ridge Farm, will open its doors to visitors interested in seeing how and why we do what we do! If you’d like to spend one or both days touring farms, get your tickets now by going here: http://asapconnections.org/events/asaps-farm-tour/ (and scroll to the bottom to hit the “next” button). It’s only $25 per carload, for both days, so pack all your friends in and make a weekend of seeing where your food comes from! Want a FREE FARM TOUR PASS? 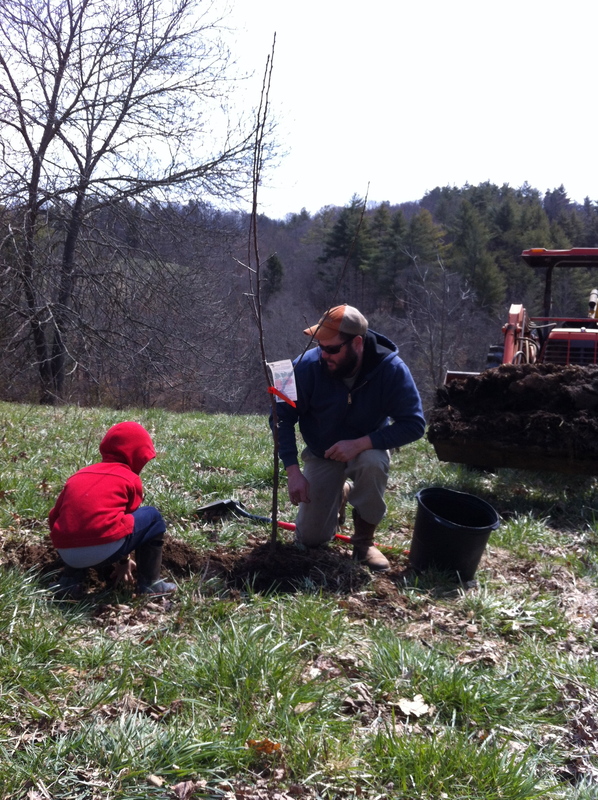 Want to learn the ins and outs of Dry Ridge Farm? 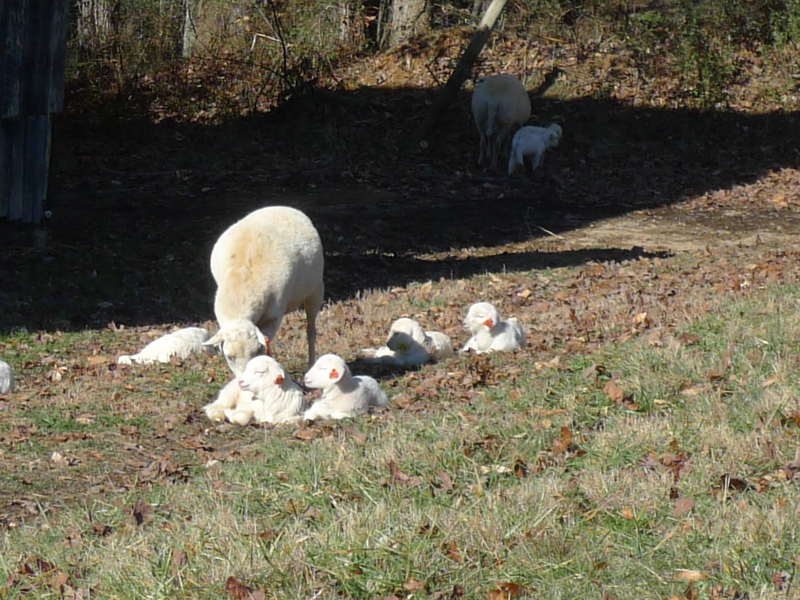 Want to coddle newborn lambs? Then, reply to this email to let us know you’re interested in volunteering with us during the Farm Tour! You’re welcome to volunteer one or both days, and if you volunteer for one day, we’ll give you a free pass to go visit other farms on the second day of touring. Farm Tour is a super fun weekend, but it’s a very busy and tiring 5 hours, so please be ready to share lots of energy as a volunteer. It’s a great way to get to know us, the farm, and a bunch of other farm lovers in the area! 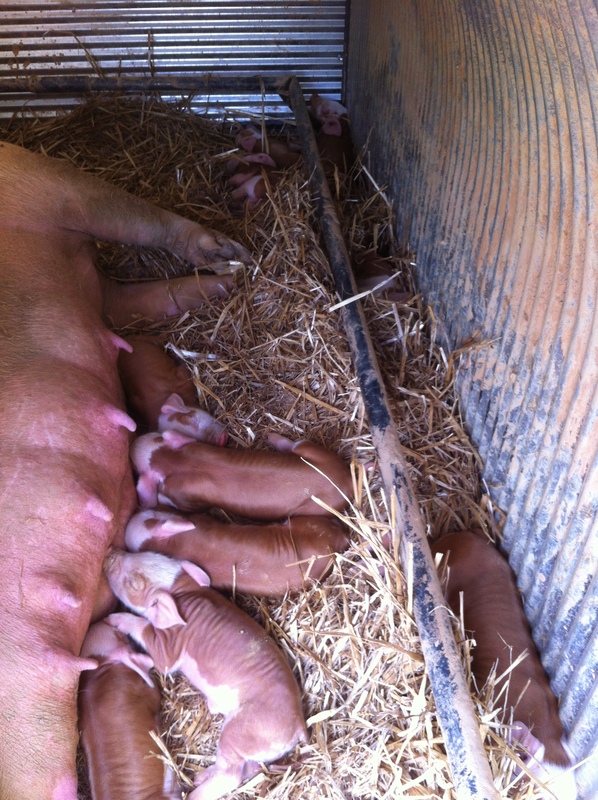 Piglets, Piglets, and More Piglets!! 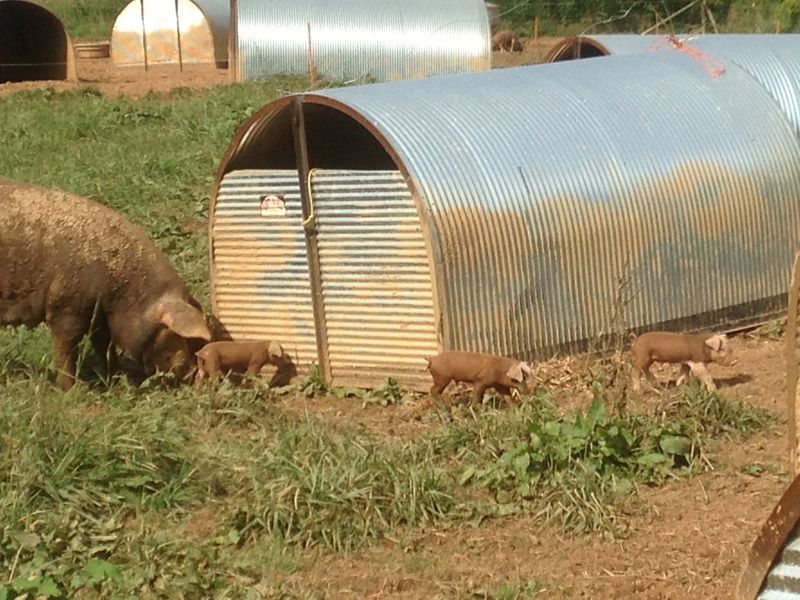 You read that right… 50 piggies are now roaming our pastures. 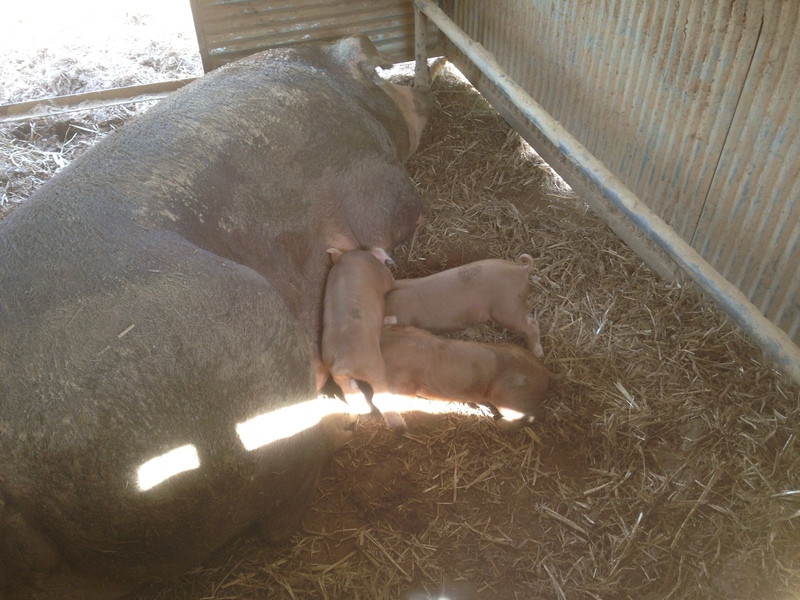 Of those, 19 are from the litters we had three months ago… which means that this round of farrowing brought us 5 litters, for a total of 31 new babies (there’s a word to expand your vocabulary; sows giving birth = sows farrowing)! The not-so-great news is that, for 5 litters, 31 isn’t such a great average. 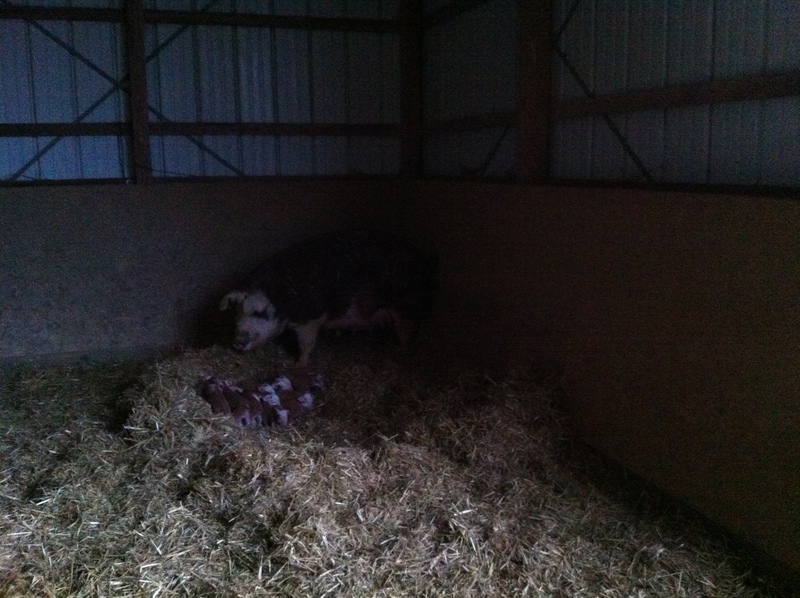 We had two sows that had some trouble keeping their whole litter and have ended up with 3 babies a piece. 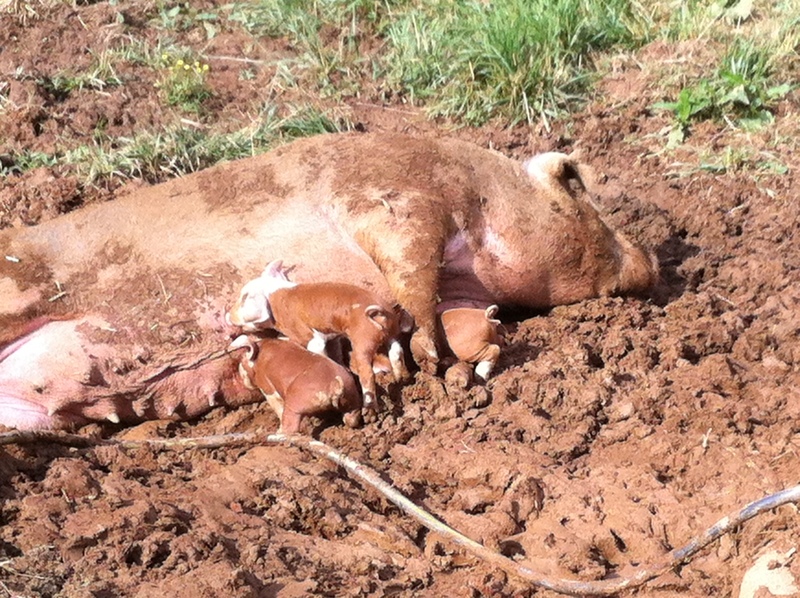 That does mean that we had good, large litters from the other 3 sows! Enough with the numbers, Wendy, time for pictures! A pretty rare sight. Both Mom & Dad with babies. 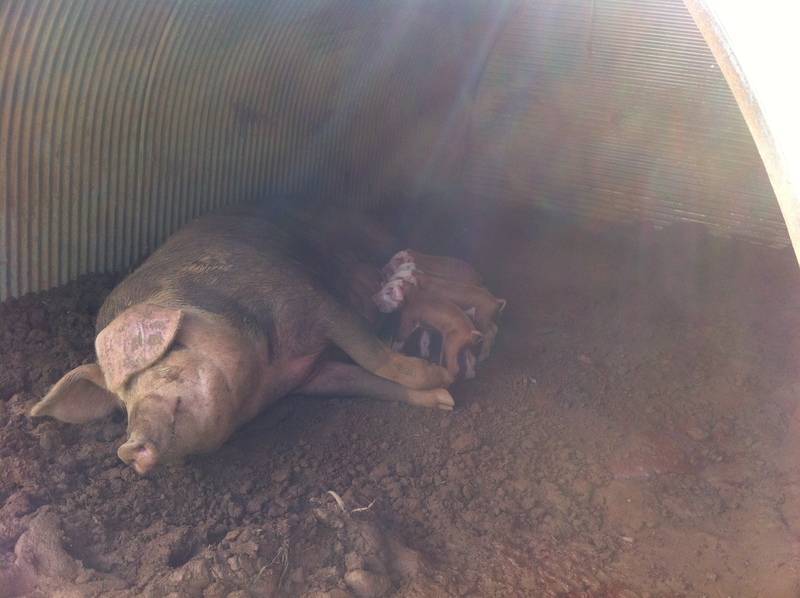 Not many boars are patient enough to have eight pigs nosing around next to them… but I guess he was cozy snuggling with his lady. Mom’s making sure I’m not messing with anyone. A small, but happy litter. And we moved our little meat chickens outside today! 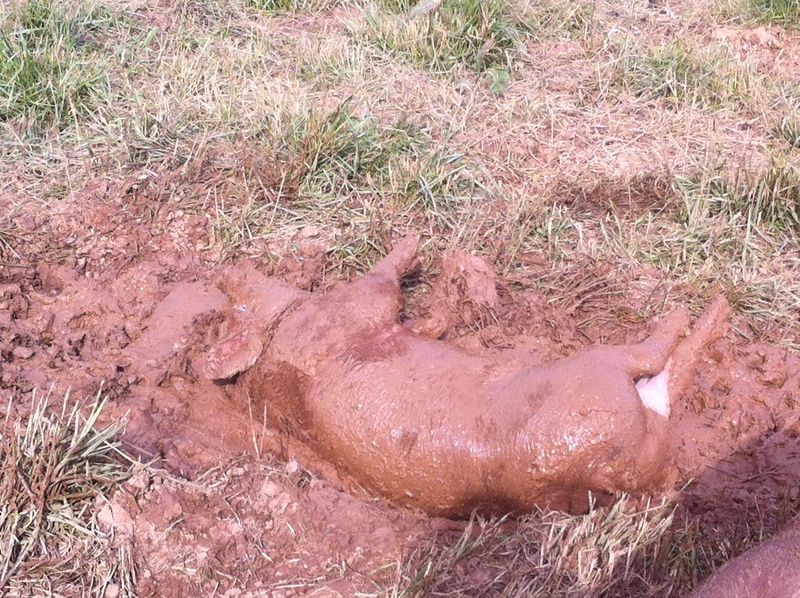 In case the last three videos don’t work (I have a lot of trouble inserting videos in posts or newsletters), check them out on our facebook page to see what piglets running, eating, and playing in mud looks like! 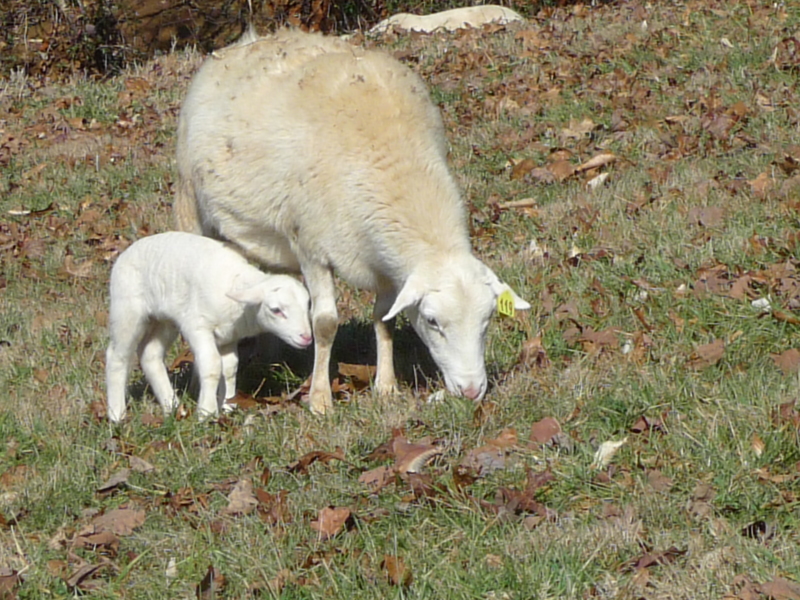 So, I just took our Kubota mule for a little picture-taking (quite possibly my favorite part of my job, though one I could improve on), and I did so explicitly in the hopes of getting a picture of our first lamb of the September 2013 lambing season. Sadly, no dice (or lambs). Today’s the first possible day we could have a lamb arrive, and apparently our ram was a little lazy during the first day he spent with our girls. Fear not, though. 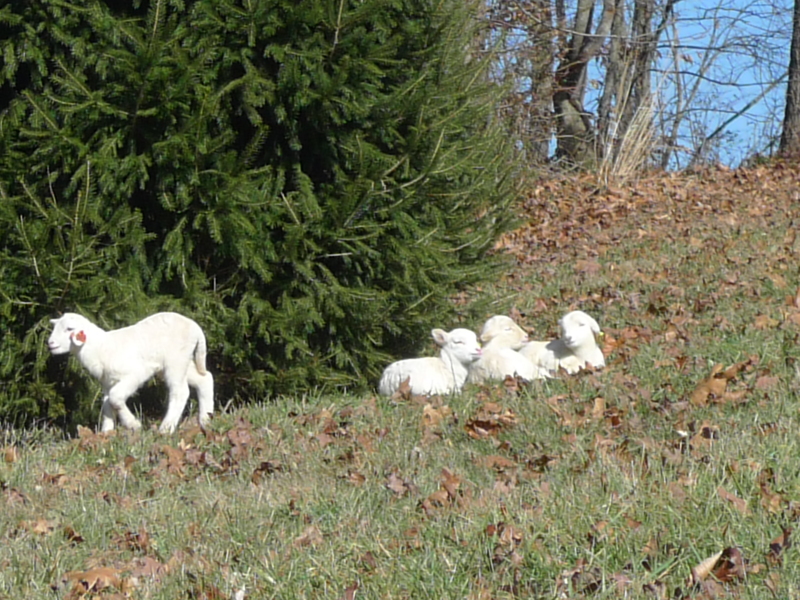 As soon as that first little lamb makes an appearance, we’ll post the picture on our facebook page. On that note, have you liked us on Facebook yet? We’d appreciate it if you would! Click here, then hit the like button! The time is NOW, folks, to sign up for our next Community Supported Agriculture (CSA) season and start receiving a box of your favorite Dry Ridge Farm meats (plus eggs!) every two weeks! And by “NOW”, I mean you’ve got to sign up by this Wednesday, August 7th! 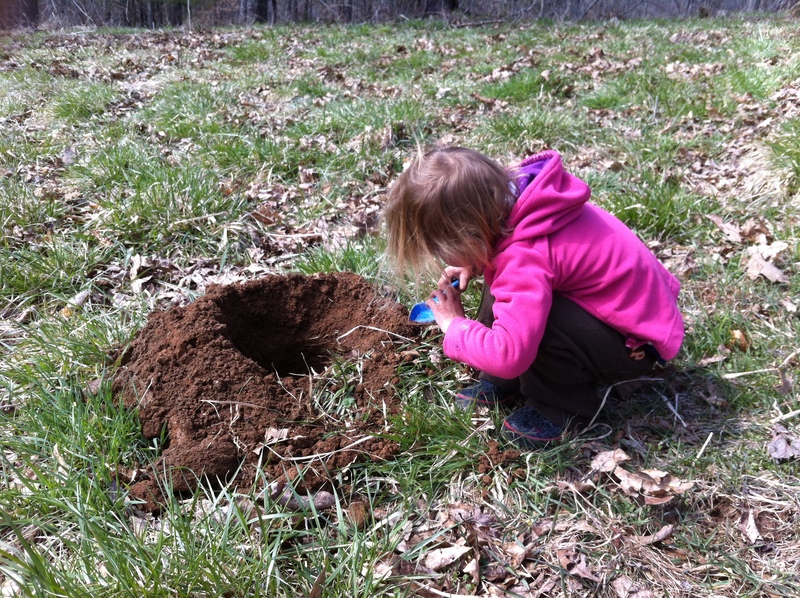 Why not take two minutes (literally) now and go here https://dryridgefarm.org/join-our-csa/ to sign up?! You know you want to… Everything you need to know about it and a handy-dandy online sign up form is at that link! – Each share box typically includes 3-4 main meal meats, a breakfast meat, and eggs. – Half shares (portioned for two) and full shares (portioned for four) are available, for $100 or $200 per month, respectively. – By signing up, you commit to a three-month season, with share pick-ups or delivery on the second and fourth Wednesday of each month. – Pick ups are typically at French Broad Food Coop Tailgate Market, Wednesdays 2-6 pm, but if you’d rather pick up at City Market South or Oakley, just let us know! – That’s right, we offer home delivery! To anyone with an Asheville address for only $25 per season! – This season starts on August 14th and runs through October. – You can pay in monthly installments or pre-pay for a whole season. It’s a beautiful Friday summer afternoon here at the farm. 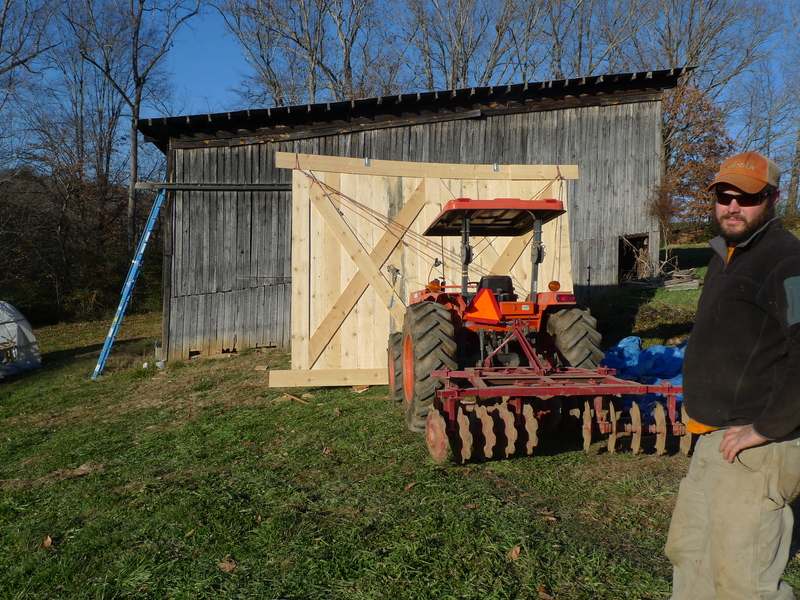 After finishing another section of fencing this morning, Graham’s giving the truck and our Kubota mule a check up, while I sit on the porch reflecting on the past few months. 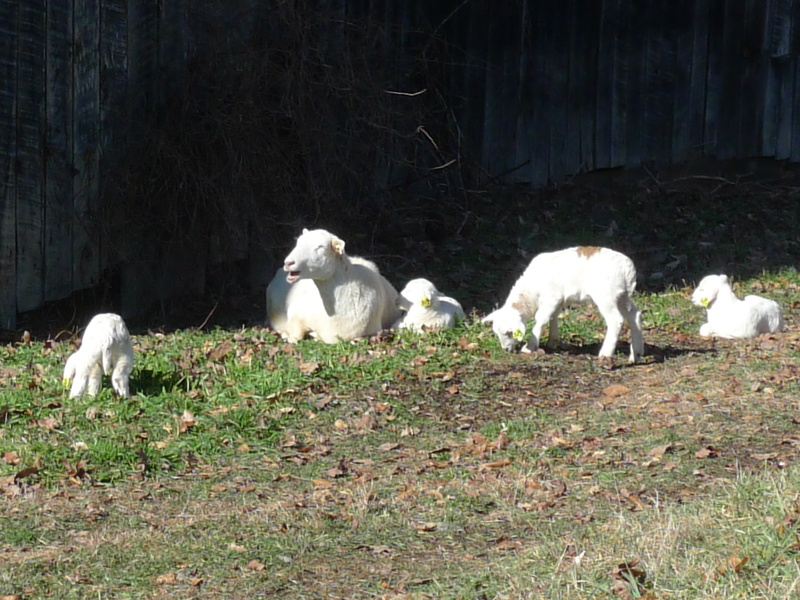 After a Spring that was very pig-centric — getting them settled into their new digs, getting a new boar, and having three new litters — June and July turned out to be sheep months. We’ve (finally!) had a little bit of time to try to get ahead of the game and started on improvements, which means that Graham’s put in about a third of our new permanent fence lines! The sheep have been great at letting us know where things aren’t quite right… where strands aren’t close enough together or too high off the ground; they find their way out of any inadequate fence within hours it seems, and for several weeks in early July, they were driving us straight batty. But now, they seem to be content in their field, aware that the fence is very shocking, and have stayed put for about a week. 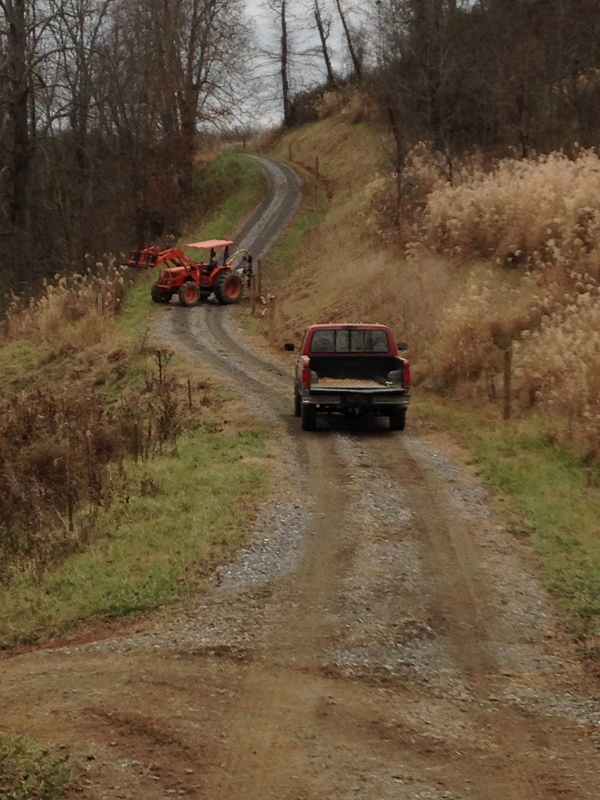 Which leaves us breathing a little easier, knowing our fencing’s on the right track. Below are images of building fence. They’re misleading; Graham had already put days of work in to the fence before my parents and I helped finish it up… I just didn’t take any pictures of him working! Starting to look like a fence! To keep these little buggers in the right spot! Fencing has been high on our priority list so we can get away from moving temporary electric netting for the sheep, and I’ve been impressed with the speed at which Graham’s been cranking it out (shout out to our buddy, Brandan, who’s been a huge help in the fencing department!). When I commented on Graham’s fencing speed, he said, “well, you know why I’ve been working so hard on it right?” Me: “To keep the sheep in?” Graham: “Well yeah… but I also said that when all the fencing’s done, I can get a few cows!” Now, the only time I can ever compare Graham to a 12-year-old girl at a Justin Bieber concert…. is when he talks about cows. That might be a *slight* exaggeration, but man, does that boy love cows! And so, I made that fencing comment a few months back, to get him away from ogling cow listings on Craigslist; I figured fencing would take a while. But I’m a woman of my word, so it looks like we’ll be getting a handful of steers in the next few months (and be able to add beef to our CSAs!). 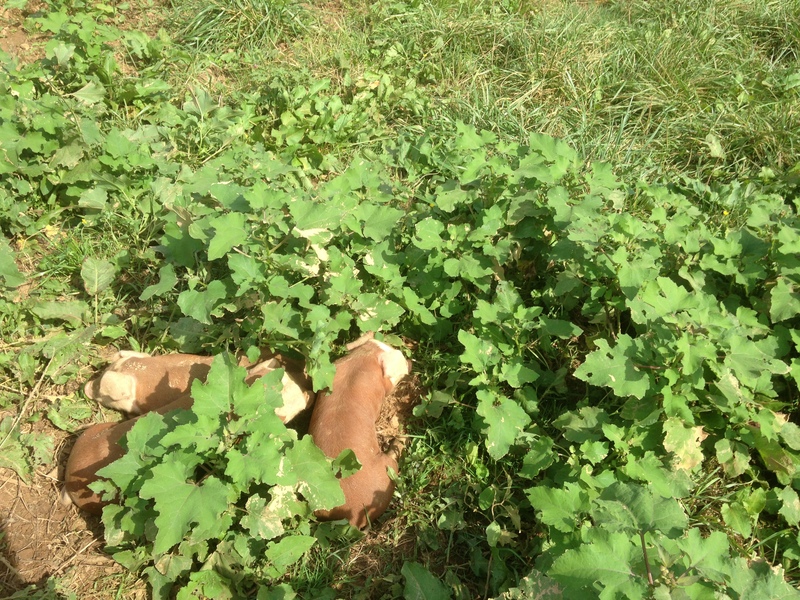 Back to sheep: we’ve also used them to clean up our weedy creek beds, and those weeds seem to be making our lambies grow like, well, weeds! 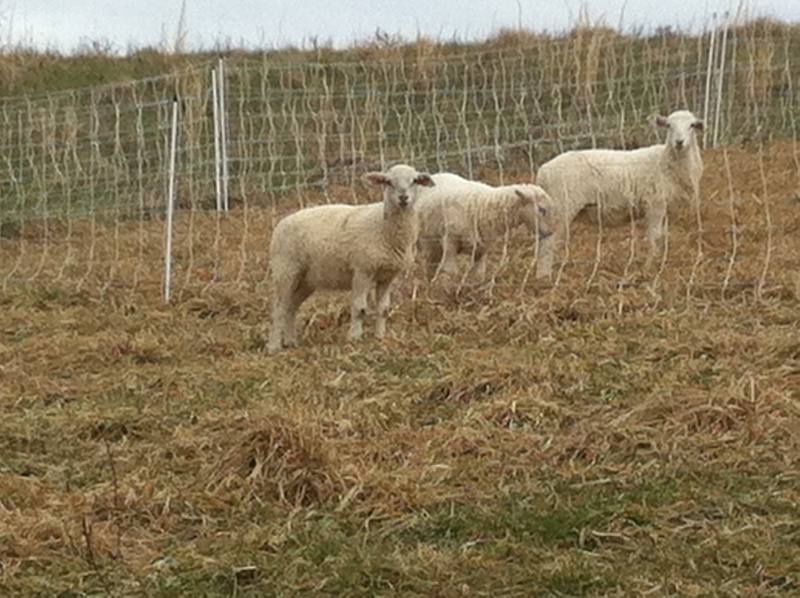 The January lambs are starting to look mighty delicious! 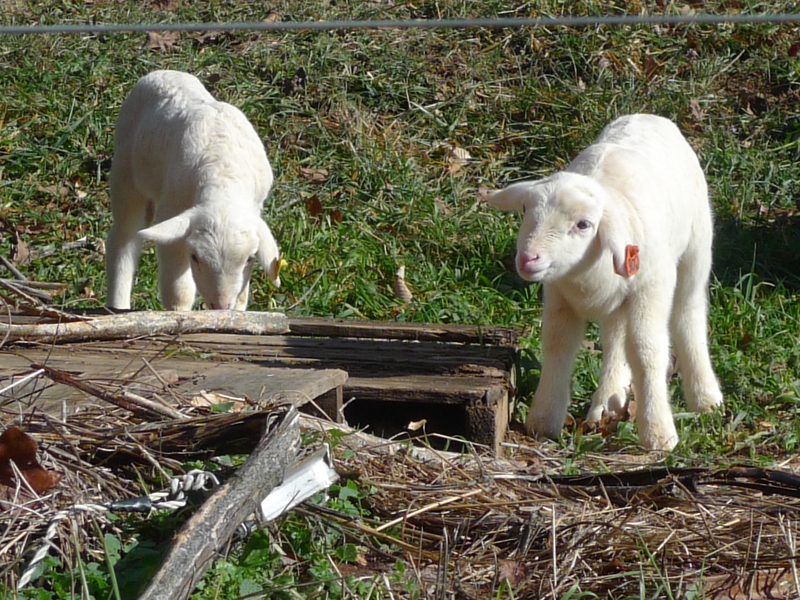 And we’ll have lots of fresh lamb available starting at the end of this month! 1. Check Better Business Bureau ratings on any business you plan to buy from. They have ratings for a reason, and they’re useful! 2. Always pay on delivery. So, we wanted the “ready to go” egg-washer, and sent a big ole check to a man in Iowa. A week later, it was cashed. Red flag. Who cashes such a sizable check. We call. No answer. Leave a message. (Repeat three times). Get an email after a month, “yeah, it’s been raining a lot and we’ve had flooding. The washer just needs a few tweaks, then I’ll send it next week.” This is when we check BBB. Despite sounding like a good guy on the phone and having a fancy, professional website, the business has an F rating, with four complaints filed in the past two years. Damn. This dude’s a con! Okay, week rolls by… no egg-washer. We call. No answer. Leave a message (repeat a lot). A month later, say mid-July, we get an email. “My best friend died and I’m gone for the weekend, but I’ll send your egg washer next week.” You see a trend? This is when we decided to break out a can of Graham’s Uncle Lawyer on him, and after a very civil, but firm communication from Uncle Lawyer, the man began to listen. It probably helped that Uncle Lawyer mentioned that his “law partner attended Harvard Law with ____, the Iowa Attorney General and Iowa has stringent consumer protection laws with sever penalties.” A comment about which I said aloud to Graham, “well, that’s convenient!” And Graham just smiled. 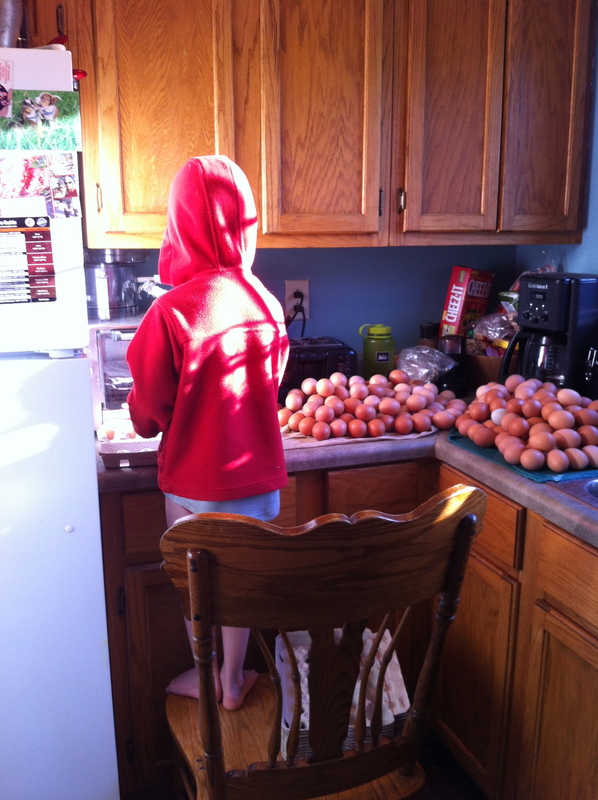 The Iowa egg-washer man seemed to be as gullible as I am. Within 10 days though and after a few more emails and a few more excuses (“my secretary got scared off by Uncle Lawyer’s email” and on the day we’d given as his deadline, “I was hospitalized today”), we finally got a bill of lading. It was shipped! I imagine the person who sent it to us probably did have a bad few months, and part of me feels a little sorry for the guy. He obviously did end up coming through with the machine. But the fact remains that you don’t cash a check three months before sending the item that the check’s paying for. I didn’t get excited until we took the box off the machine. We weren’t sure if we’d be getting anything resembling a real egg washer after the whole fiasco. BUT now I’m giddy about it. It’s gorgeous! We’ll be building an egg washing room for it, complete with shelving for dirty eggs, boxes, cartons, and all in the next couple weeks, and then… This little beauty will save us about six… yes, six… hours of time every week! 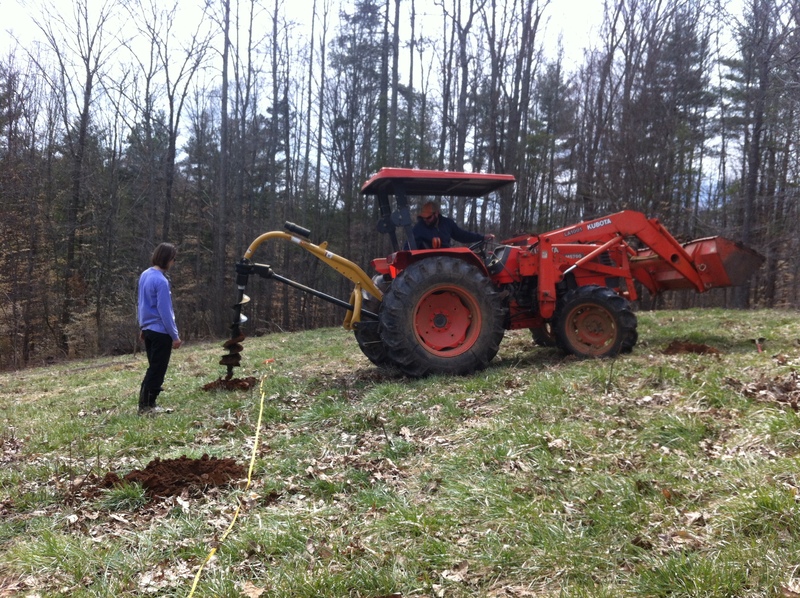 More time for things like fencing! It works basically like a car wash for eggs; they travel on a little conveyor belt through jets of water and spinning brushes. And out they come on the other side, all shiny! It’s hard to verbalize the joy that this machine has brought us. 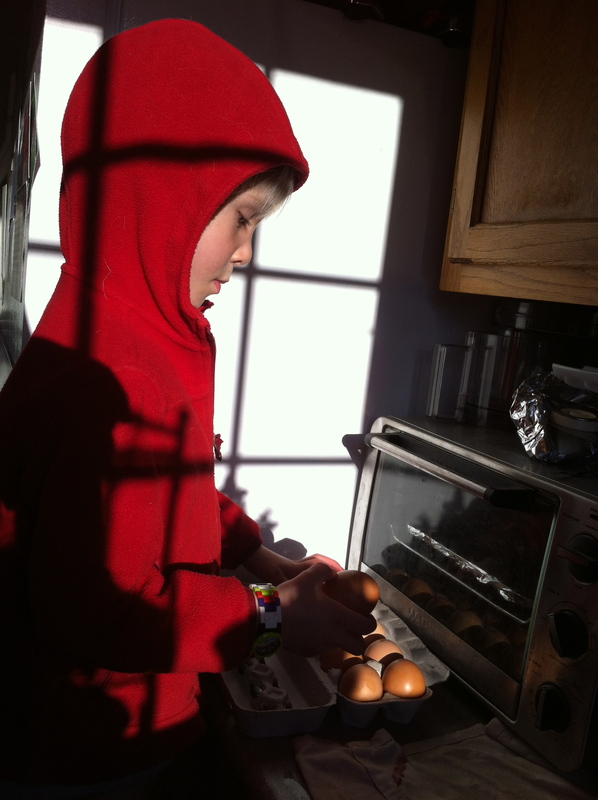 It’s a huge relief and once Graham gets our egg-washing room built, we’ll put it to work (and I’ll send out a video). For now, pictures will have to do! And we pry it open… hoping it looks good… I’m building your anticipation here, just like ours was mounting! Get brushed off by these guys! Here’s where they go in. That slot at the end of the red strips is a candler. There’s a light that comes through so we can see even the tiniest cracks. And now we can double our egg production! And finally, a little splash of beautiful and adorable and a little bit of random. Enjoy! Note: I’m working on figuring out the appropriate resolution for pictures. These might take some time to load, but they’re worth the wait! 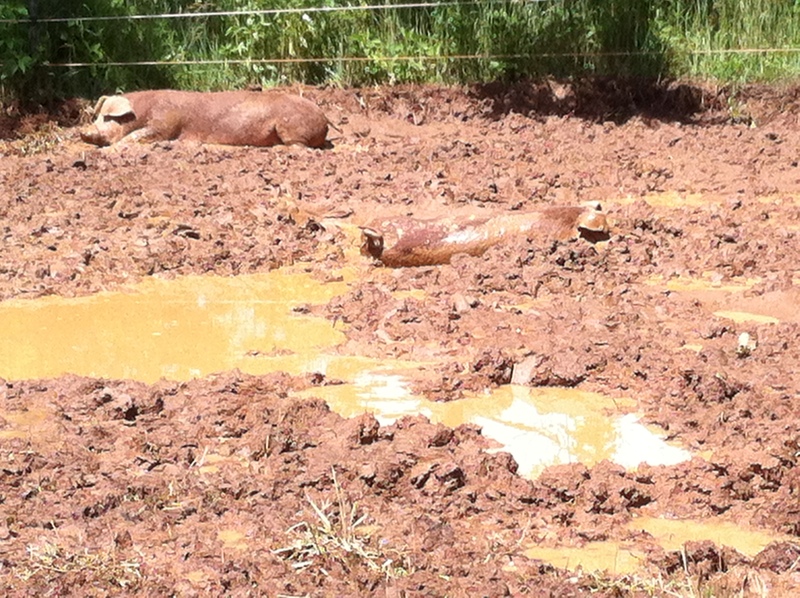 Lots of Mud, Lots of Piglets… all is good. 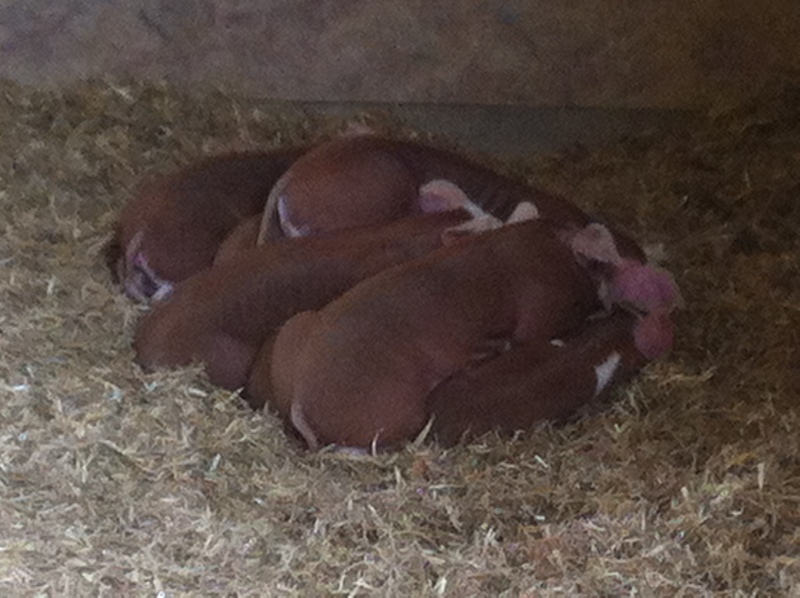 The main events these past three weeks have been piglets. They are amazingly cute. We’ve had three litters in the past three weeks, and I guess you win some, you lose some. The most recent, yesterday’s, was six wee ones from the first of our seven new sows (yup, we’re about to have a LOT more pigs!). Not a bad first go, but definitely smaller than the litter size we want. 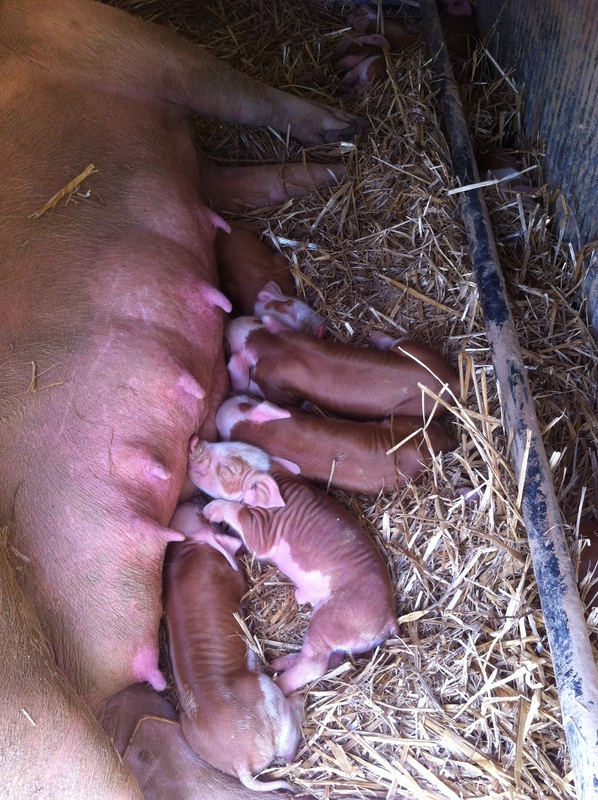 Two days ago, one of our older sows had a litter of 10. That’s the sort of litter size we like! And the first litter we had recently was Clementine’s: a measly litter of three, which is, quite simply, unacceptable from a breeding sow. Unfortunately, Clementine is the coolest sow we have; she’s got a wild personality, definitely the matriarch of the herd. She’s also our orange pig and is very pretty (as far as pigs go). But I guess this is why you don’t form relationships with farm animals. She’ll be the first that we’ll be sad to “send to the farm,” so to speak. 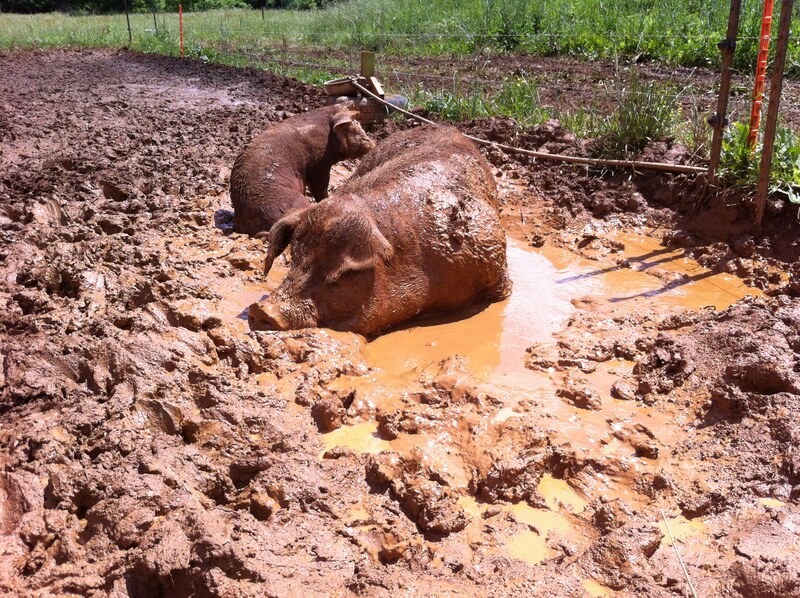 And now new pig pictures and hog heaven pictures… they are SO excited about the mud!! 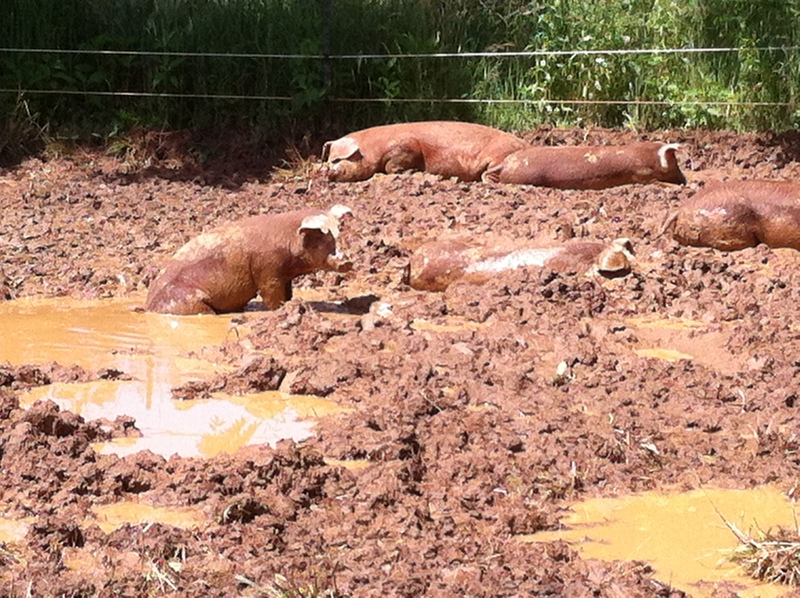 Fun fact: did you know pigs don’t sweat and their only way to keep cool is by staying in the shade or coating themselves in mud? Just an even cuter shot. Clem venturing out of the hut with her three. Last night’s litter of 6. Brand new with long umbilical cords still. … to the other, to cover every square inch. Want to play find the pig? Our boar likes coating himself too. That’s it for updates right now. A Meet Your Meat series: Eggs edition is below, but first, a quick word on Smithfield (while it’s China buyout is still on your mind). I met a man a couple weeks ago (by pure chance), who’s contracted to grow hogs for Smithfield, and we started talking numbers. Well, want to know why Smithfield pork is so inexpensive? He makes 17 cents per pound on his animals. 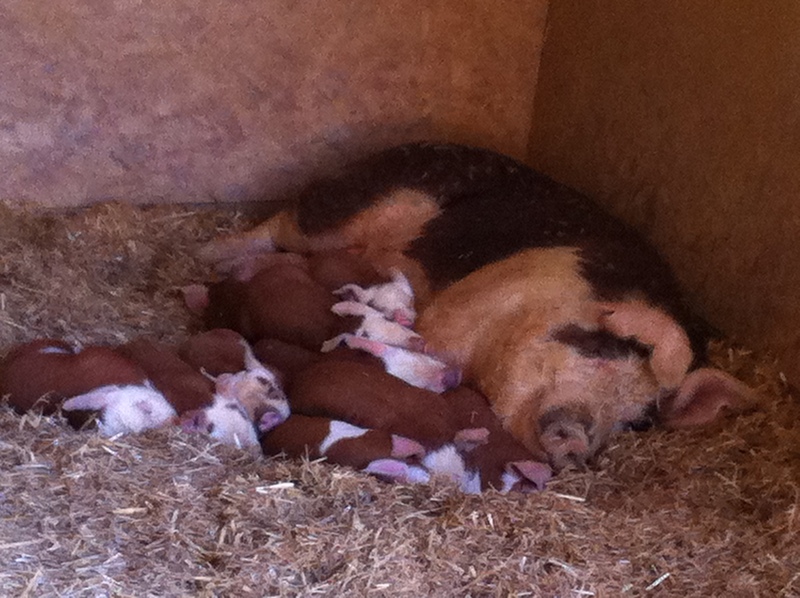 Granted, he’s the first stop after pigs are weaned and raises “nursery” pigs from 12 to 50 lbs but still! 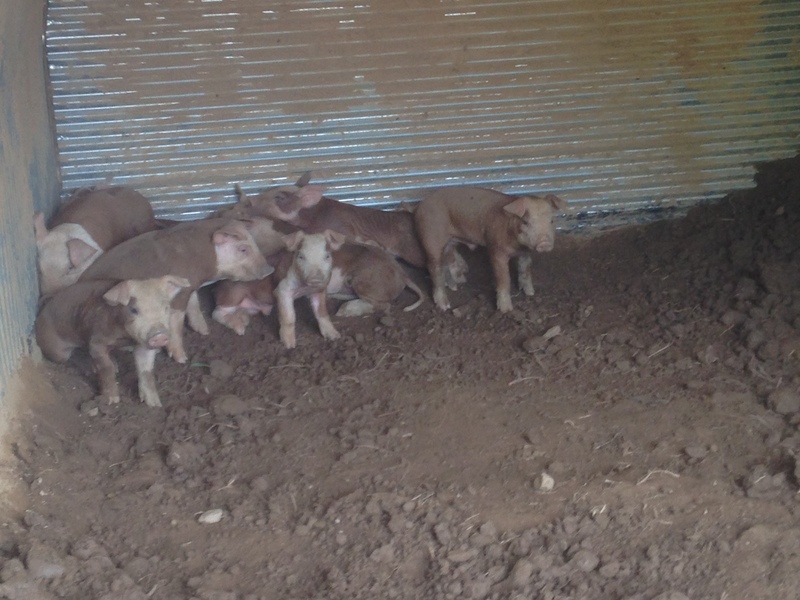 (Most hog producers specialize in either breeding, nursery pigs or growing out hogs for market). He makes a comfortable living: $85,000 for each of his three hog houses. Thing is, he runs about 10,000 hogs through each, 2,000 at a time. That’s $8.50 per hog (assuming all those hogs survive and nothing goes wrong). Just thought I’d share that little tidbit: 2,000 hogs in a barn is hard to wrap my head around. And $8.50 per hog is so shocking to me (even for wee ones)! That’s how they keep prices low at supermarkets. Lots of volume, tight margins. Eggs have the most confusing labeling options possible, and it’s hard to know how birds are actually raised, when words like “free-range” are used for birds that spend most, and often, all of their lives indoors! That’s why we make it clear that our birds are “pasture-raised.” There are very few farmers that give their birds fresh grass at all times, so as with all other animal products, looking for the word “pastured” is the safest way to go if you’re looking for truly free-ranging animals (at least until that word becomes regulated too)! 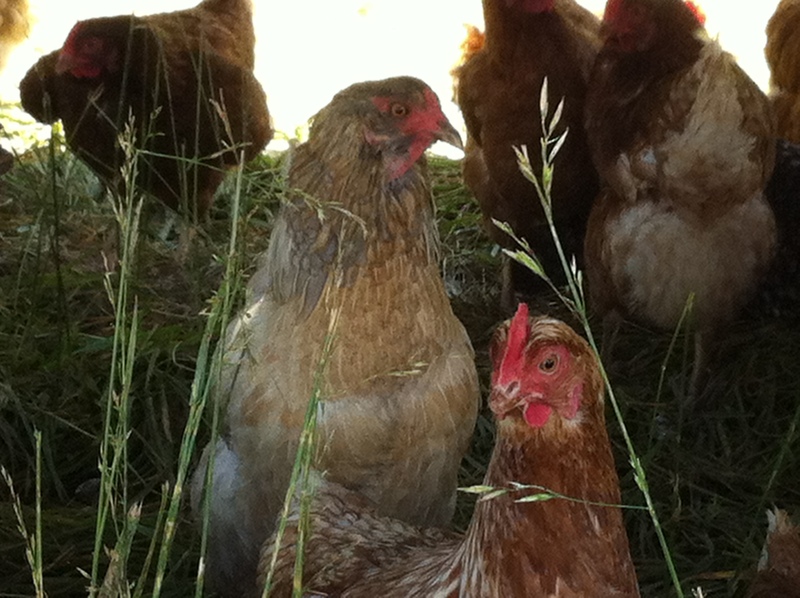 What’s pastured mean to us? Pictures are below, but the short of it is this: fresh grass and bugs all the time! 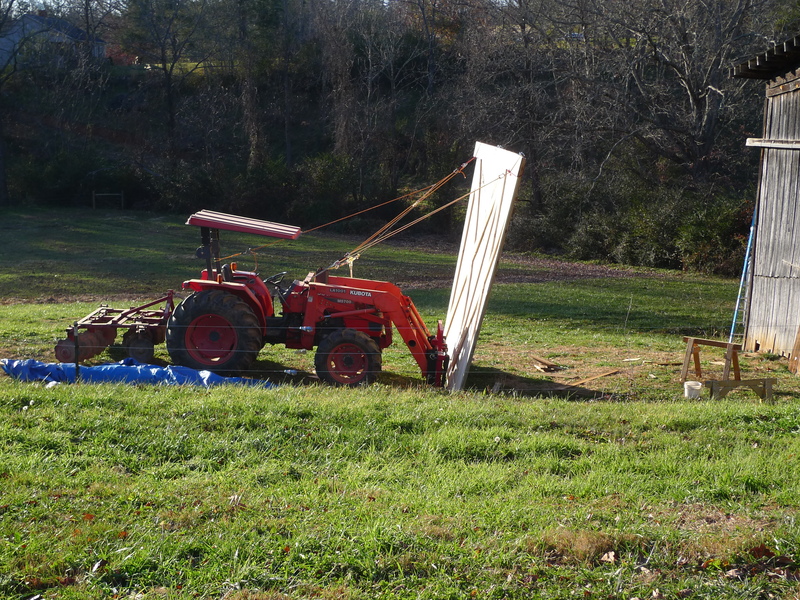 We’ve got an eggmobile, which Graham built on a hay wagon, and which we move daily the length of itself (so the fertilizer that the chickens produce through the night while safely roosting inside gets spread across our fields). We move the electric netting that’s around the eggmobile when it’s travelled from one end to the other, about every three or four days. 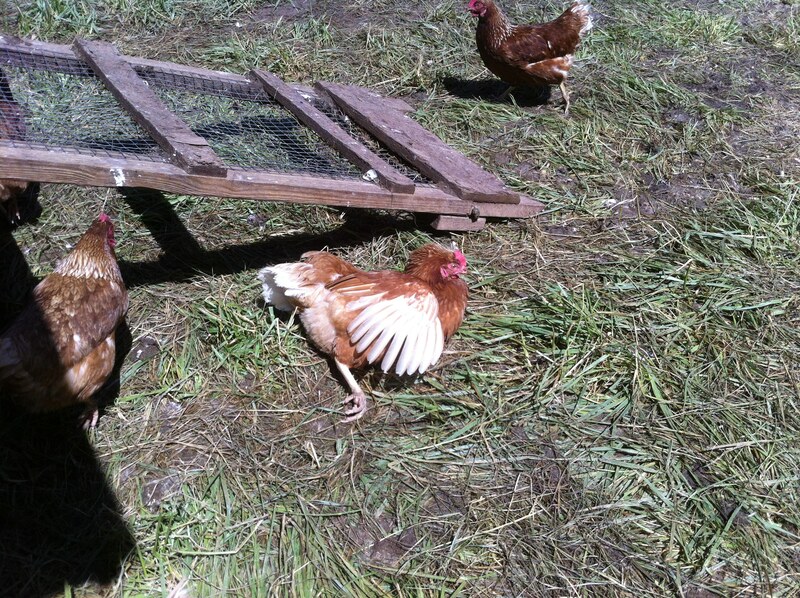 Anyone with backyard chickens knows that if hens are confined to one spot, the grass turns to a dirt lot within a week! 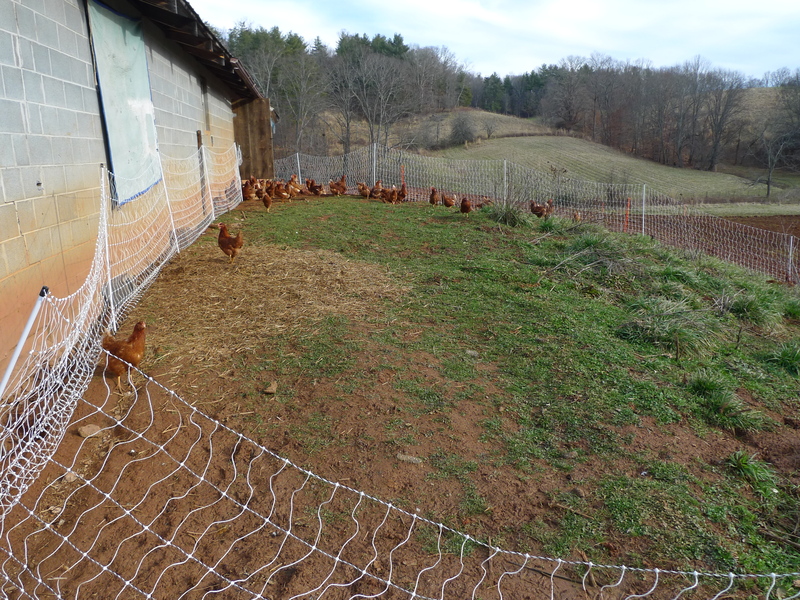 By moving our hens daily, they don’t have the time to scratch grass down to its roots, so they’re able to keep snacking on it and the bugs that live in it. 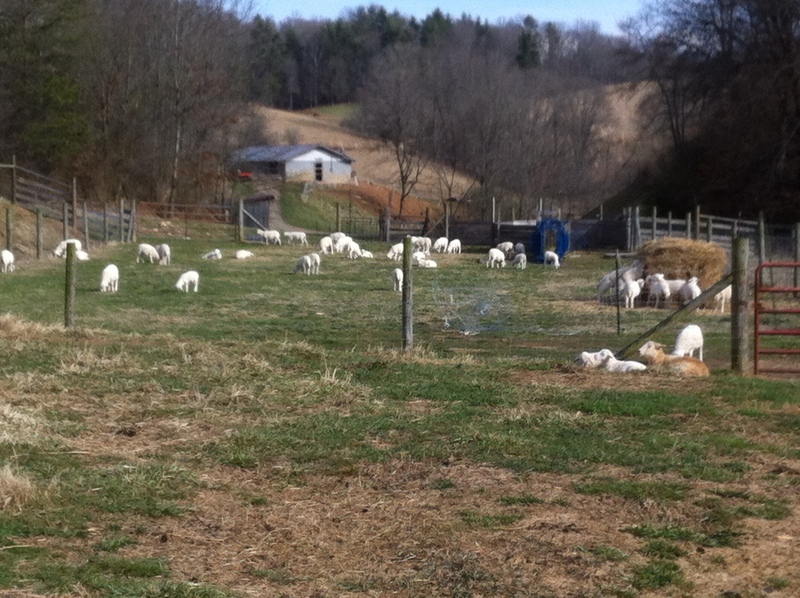 The word “pastured” doesn’t say much about an animals diet (unless it’s a ruminant, like our sheep). 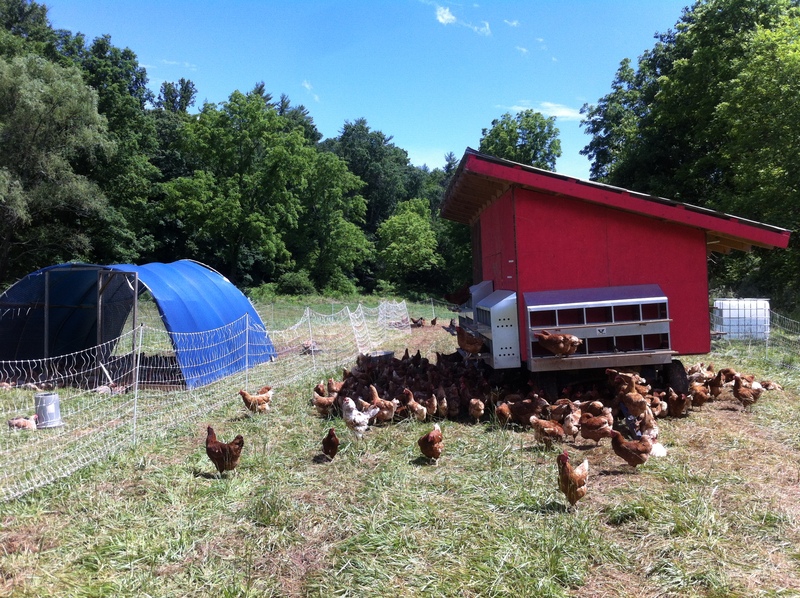 Our chickens eat 100 pounds of food a day; they can’t find that much every day on a few acres of grass! 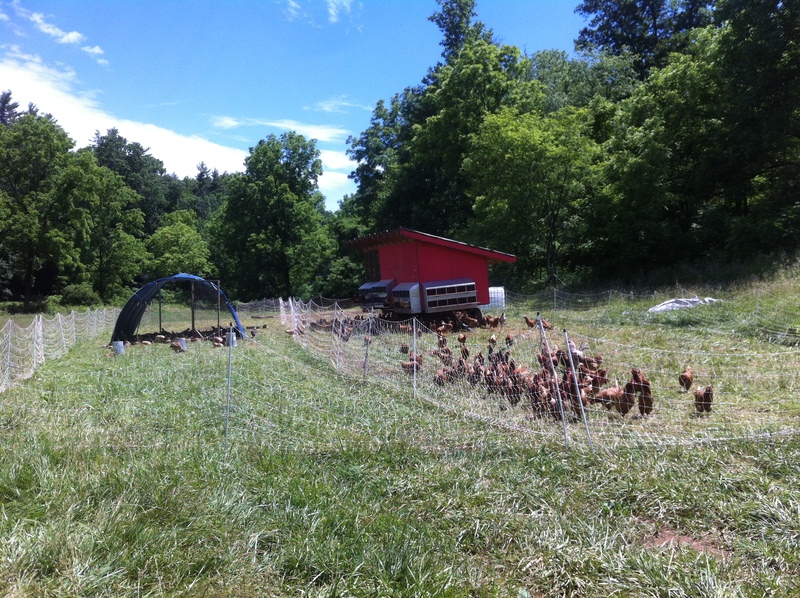 The Word “pastured” has to do with animals being in as natural a setting as possible. 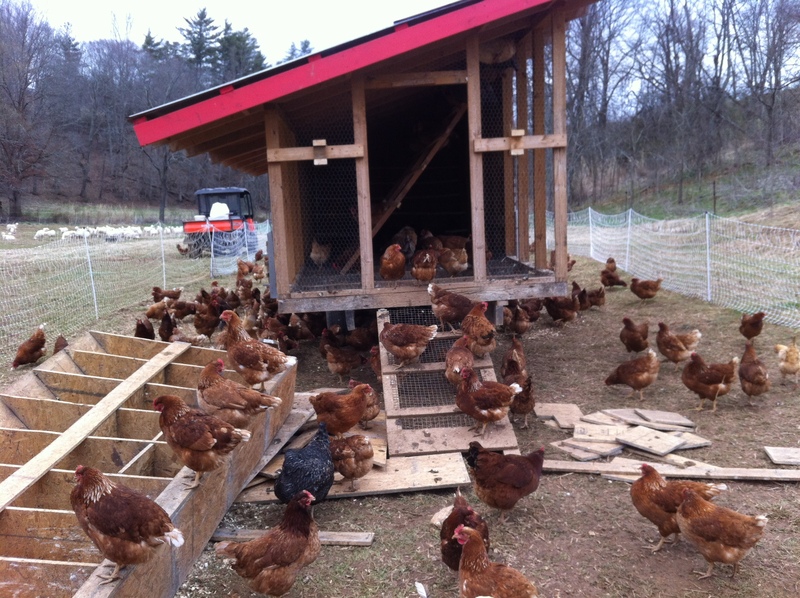 What’s pastured mean to our hens? Health. What’s that mean for their eggs? They’re healthy too! With hard shells, thick whites, and bright orange yolks… oh, and with lots of flavor! 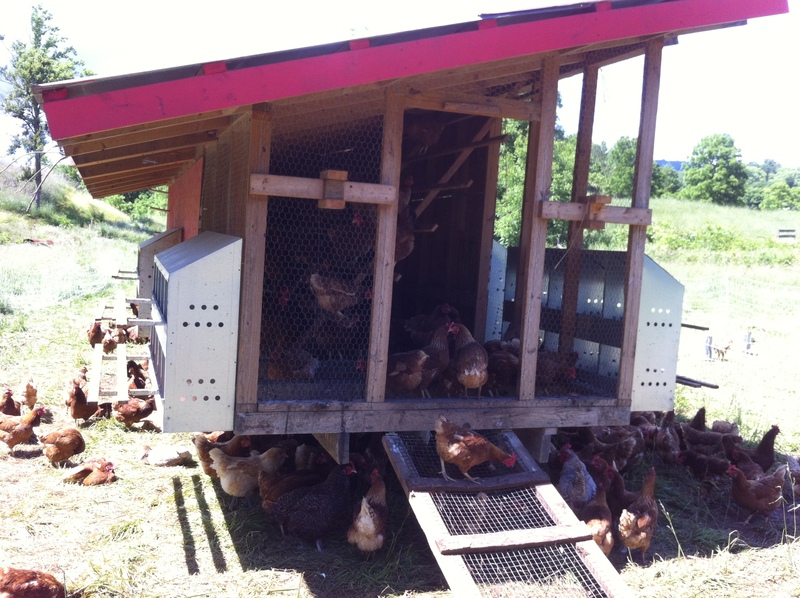 Pictures below: the blue hut is for our meat birds. 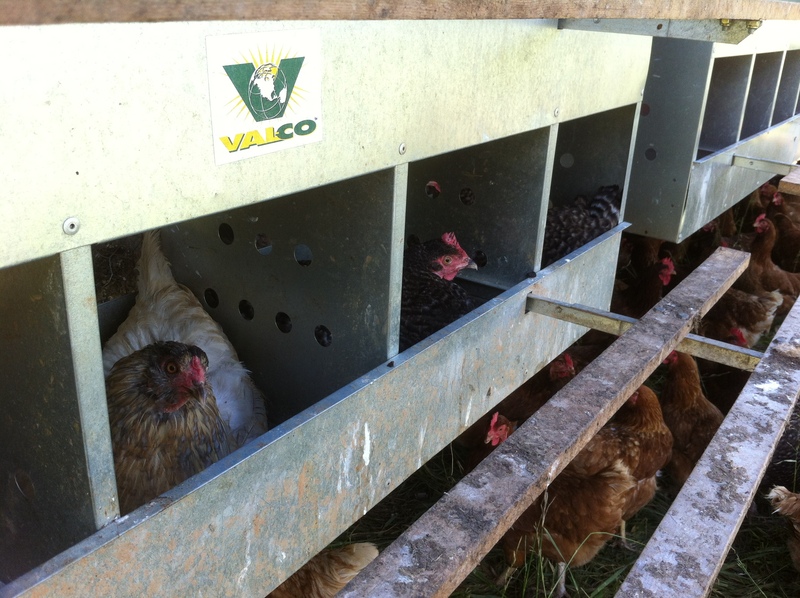 The metal things on the eggmobile are nest boxes. That greenish bird is one of the sources of your blue and green eggs (she’s an americauna). 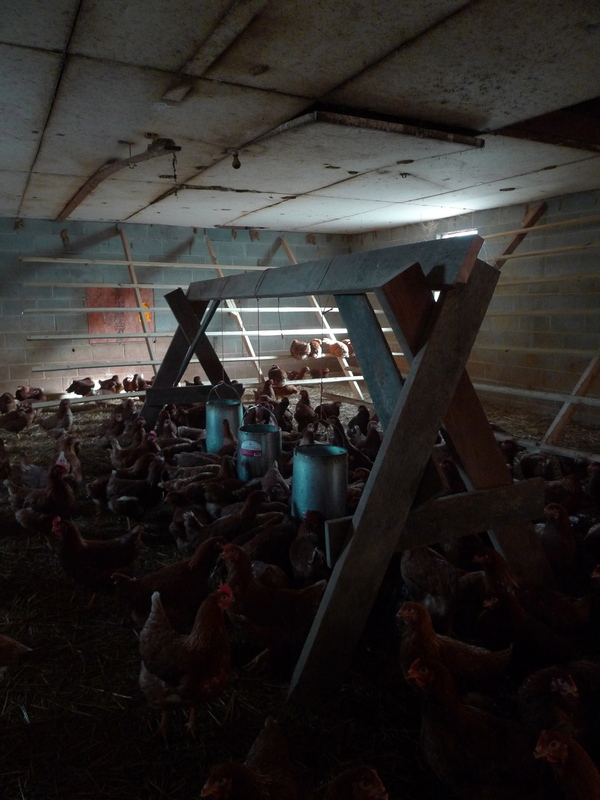 And the last picture is of the roosts inside the eggmobile where our girls spend the night. That black and white bird is a cuckoo maran, which lays dark brown eggs. That’s the meat bird hut on the left, eggmobile to the right. The metal things are nest boxes. 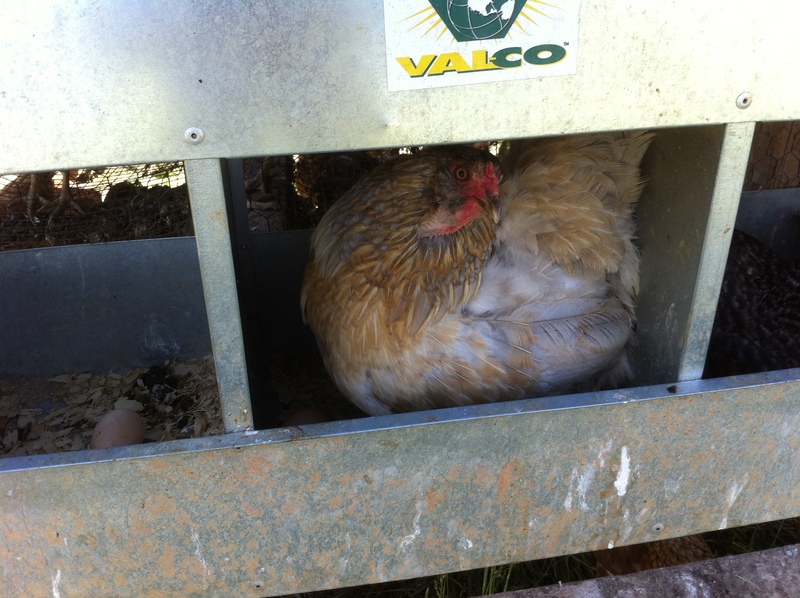 Plenty of room for each hen to have her own nest for private time. 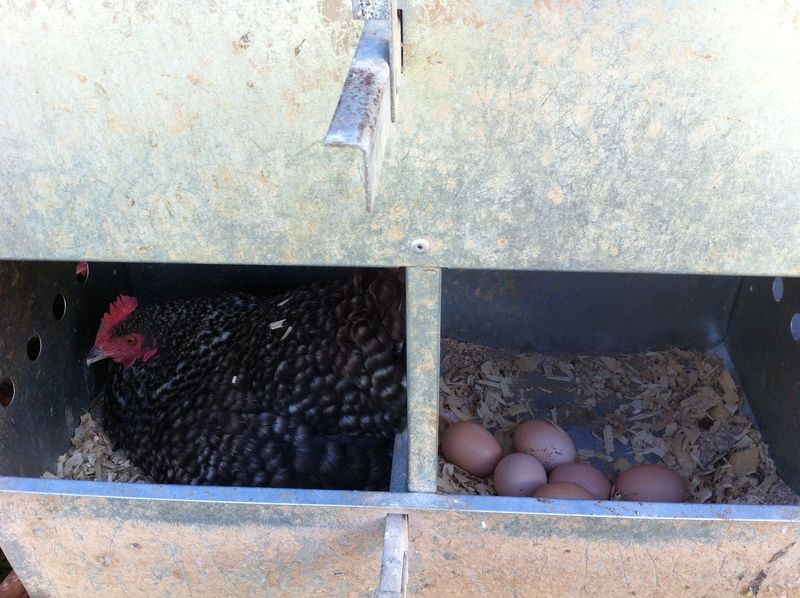 And lay lots of eggs in the morning. This one’s an Americauna. She’s responsible for some of the blue and green eggs. Cage-free- Birds live indoors their whole lives, but they’re not in individual cages. 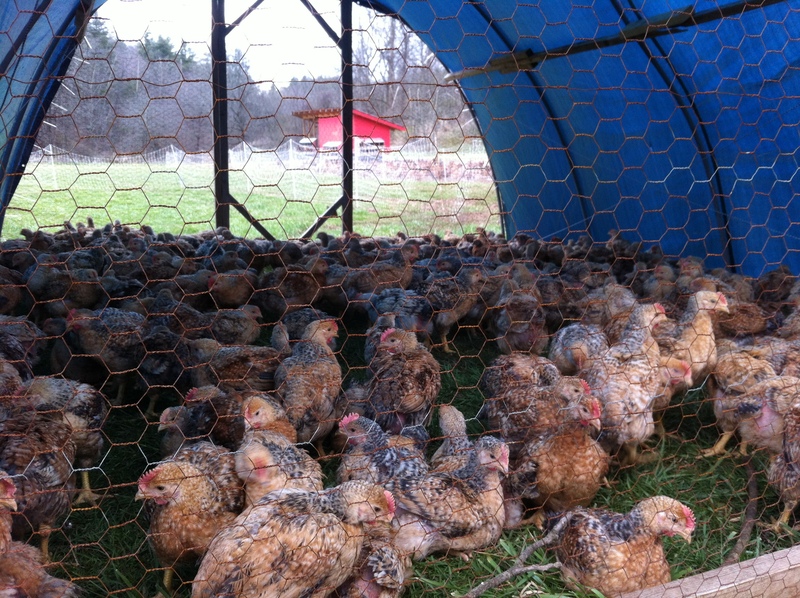 They’re typically in large pens or walking around a very large barn (with several thousand other laying hens). 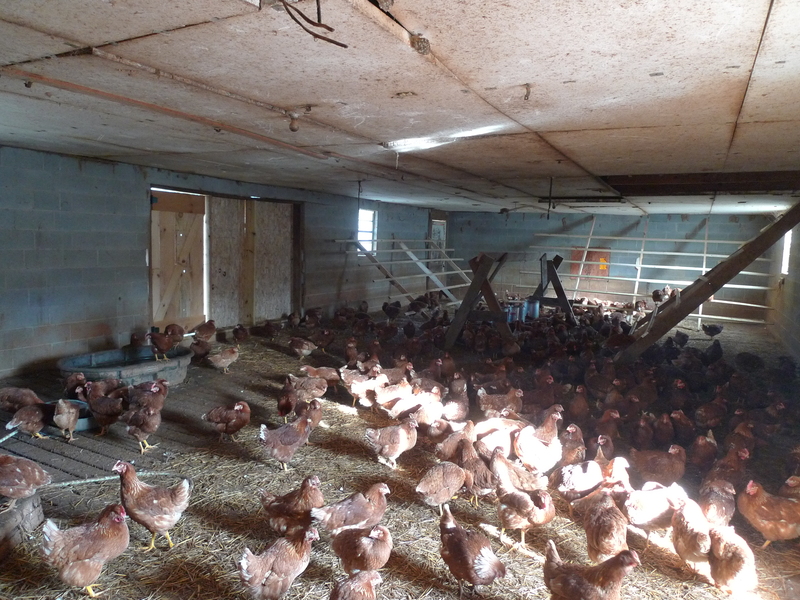 Welfare conditions vary; some large barns have lots of space/chicken. Many don’t. Free-range- The legal requirement is that the birds get some sort of access to the outdoors, and there are no size requirments for that. In most cases, many chickens never actually find the door to go outside, and the outdoor space never changes to another spot, so it’s a dirt lot (or concrete, for that matter). Organic – The birds get feed that is organic. They also have to be cage-free and have access to outdoors (in the same way as free-range) and no routine antibiotics are used. Why aren’t we organic? Well, let us know when you want to pay $7/dozen, and maybe that’ll change. Organic feed is very expensive and quite scarce! We don’t give any of our animals routine antibiotics though (or steroids or added hormones). Vegetarian-fed – This one’s my pet peeve, because how is a vegetarian chicken a good thing? They’re supposed to eat bugs and worms! This labeling started because some large producers started feeding animal byproducts to their chickens (including chicken). But it just means they’re indoor birds who don’t get to eat bugs or worms… and who also aren’t being forced into cannibalism (you’d think that’d be a safe assumption, wouldn’t you?). No one feeds chicken byproducts to chickens anymore, regardless of whether a “vegetarian-fed” label is on there or not. Interested in more? I found this interesting article, called “Pasture-Raised Risks Losing True Meaning” about large companies starting to use the “pasture-raised” term… and to Organic Valley, it means the same as the pasturing requirements for organic – that is, 120 days on grass per year plus 30% of the rest of the cows’ diet from hay or silage (which leaves 40% for grain feed)… that’s what Organic Valley requires to call their cows “pasture-raised” – interesting, ain’t it? We’ve had a few other activities going on these past couple weeks, including another few dozen baby rabbit births, but no event has been so big as The Great Hog Migration. It happened a good five weeks after we wanted it to, but the hogs have moved out to their brand new digs in our pastures again! Why the change? 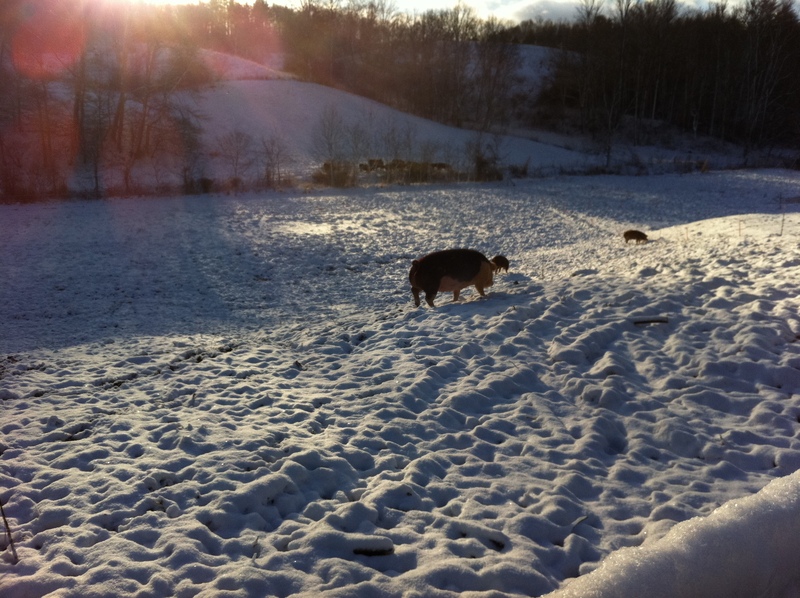 The way we set them up last year, they had to walk up and down and hill to get from shelter to pasture. Their shelter was a barn that was already here, so we were trying to find a use for it, but the fact is that hogs going up and down hills is bad news. They create trails of dirt which rain promptly washes downhill. 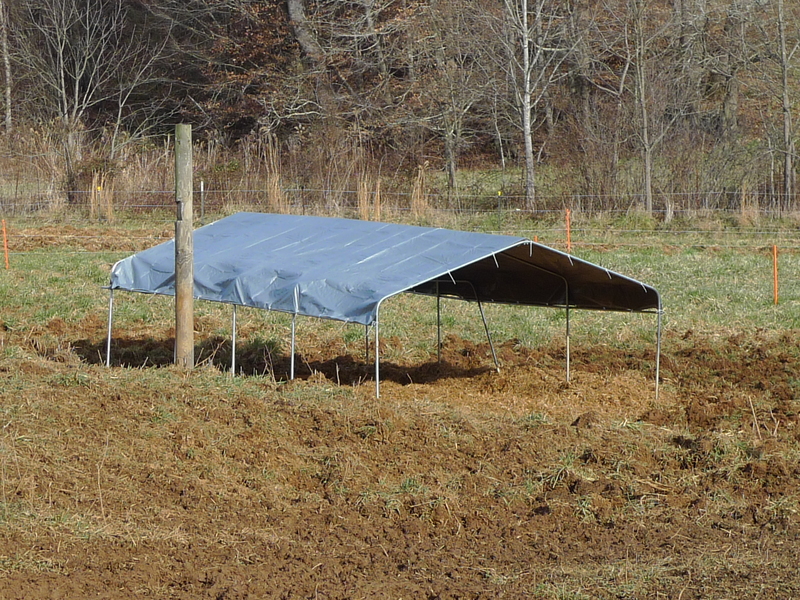 So, when we went out to set them up for this year and noticed how big of an erosion problem we had, we decided to go to our “ideal” hog raising strategy, which we would have used had that barn not been there in the first place. Now, they’re on flat land, with metal huts in which to snuggle at night and which provide shade during the day. And as sows get close to having litters, they get their very own hut for the six weeks they’re with their piglets, and they simply move to the next field when they’re piglets get weaned, so the babies stay back in the field where they’re most comfortable. And we’re hoping this system could actually work through the winter as well, since eventually we’ll likely use our big riding arena barn (where the pigs spent their last couple months) as a lambing barn. Little pig was fine following the big girls! 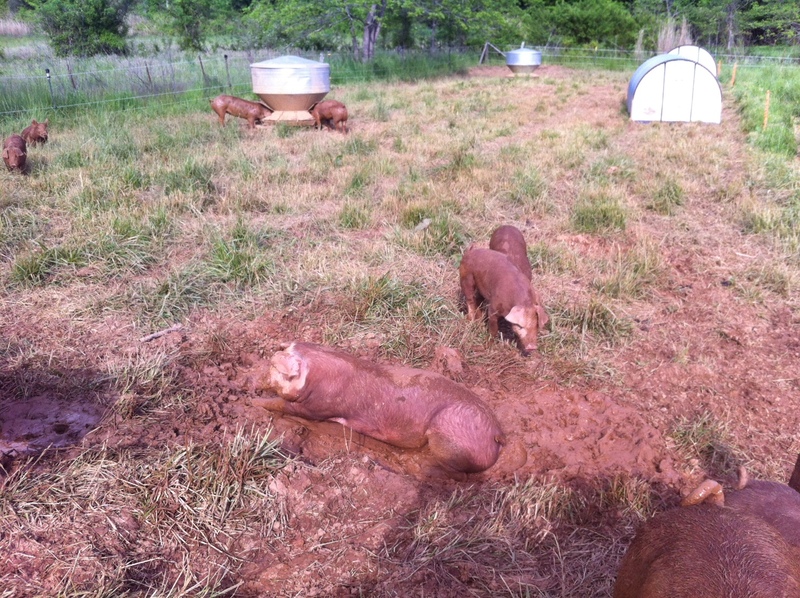 Sows and boar back on grass and rooting immediately! Might very well be this boar’s first foray on grass. We bought him from a nice dirt lot. Not sure where he was before that, but he seemed intrigued by grass! 1. 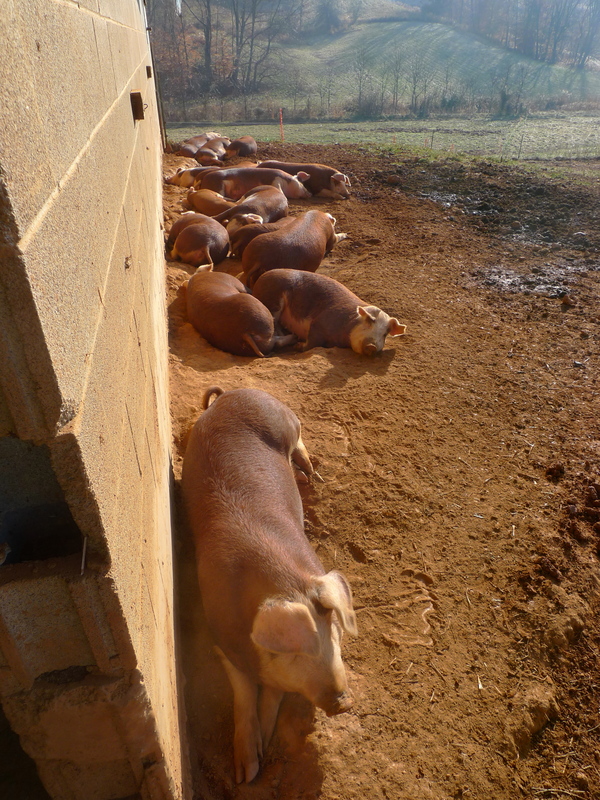 Sows and boars, who are used to being herded and are familiar with the field to which they’re moving, are much easier to herd than to load on a trailer. It was a leisurely 15 minute walk. 2. A group of twenty growing pigs, who don’t remember that field where they were born and have never been herded, should be loaded on a trailer. They’re a complete disaster to herd; one will inevitably try to go back to where he came from, convincing all the others to run back in the wrong direction as well. Everyone, human or pig, gets hot and tired and frustrated. It took us about an hour and a half to get them the same distance as their parents! An outsider might have found it a pretty funny spectacle. In the moment, pigs outsmarting us was not funny. 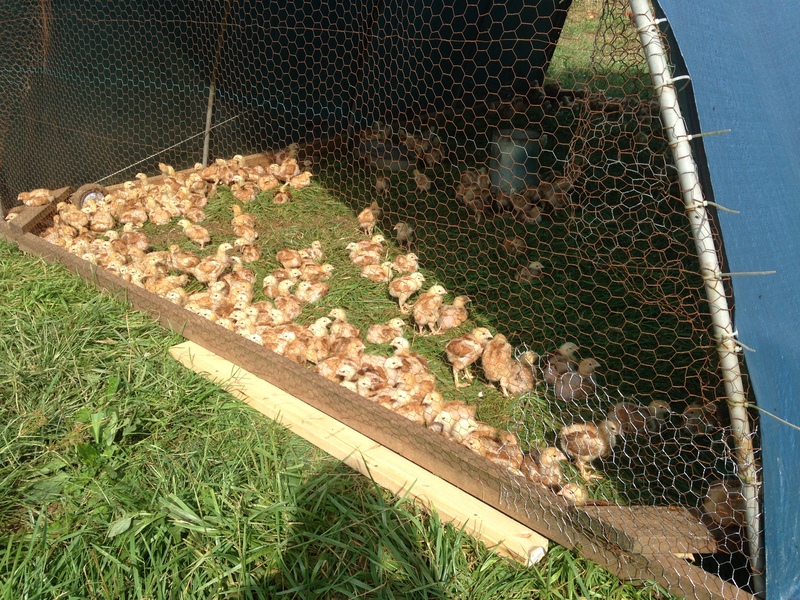 Our animals’ welfare is our number one concern at Dry Ridge Farm. We’ve chosen to raise animals because we enjoy having them around and taking care of them, so we make sure they’re as happy as possible while in our care. That’s why our hogs spend their lives out in our pastures, rooting for grubs and nuts and soaking in wallows with their buddies. 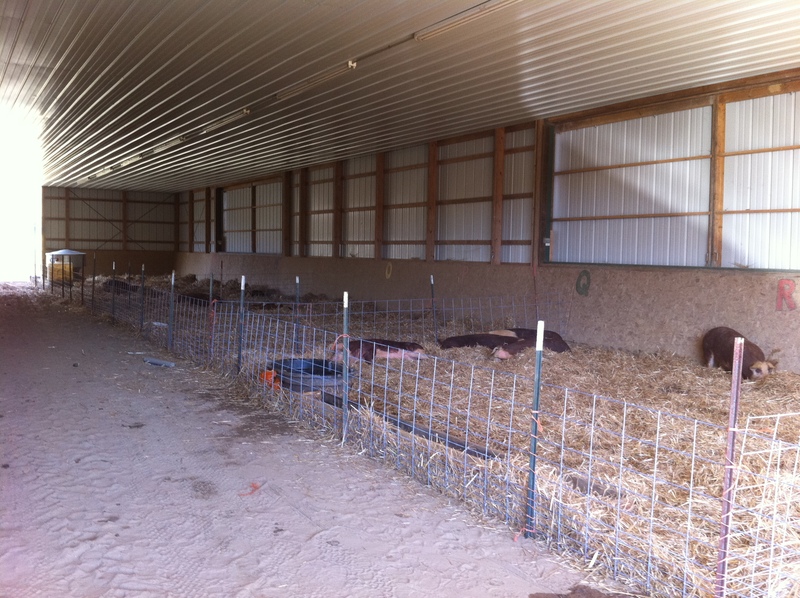 That’s also why for a couple months this winter, we moved them into one of our huge open air, dirt-floored barns. 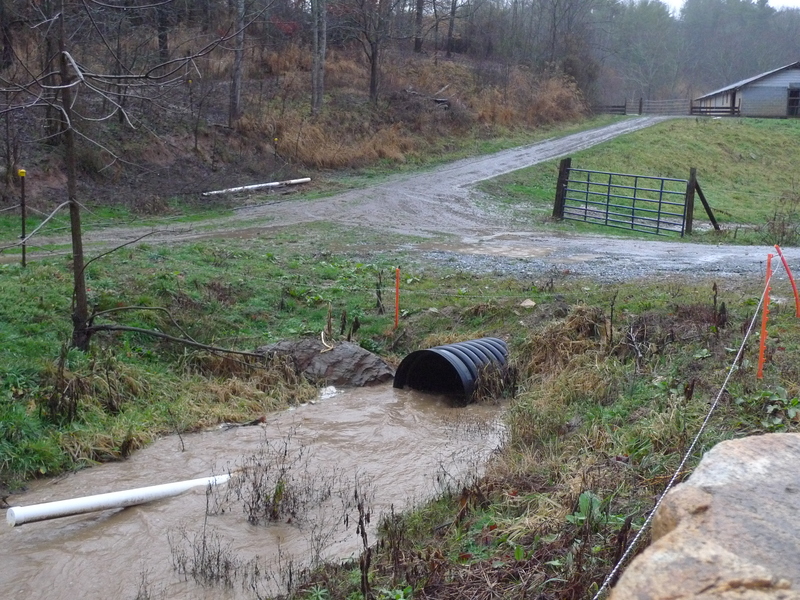 The record rainfall this winter was threatening to wash away our fields and more importantly, the wet and cold was threatening our piglets… and making them miserably cold. Now, everyone’s back on pasture, and we think we’ve found a shelter system that might make them comfortable enough to spend the winter out there as well! Want to know more about it? 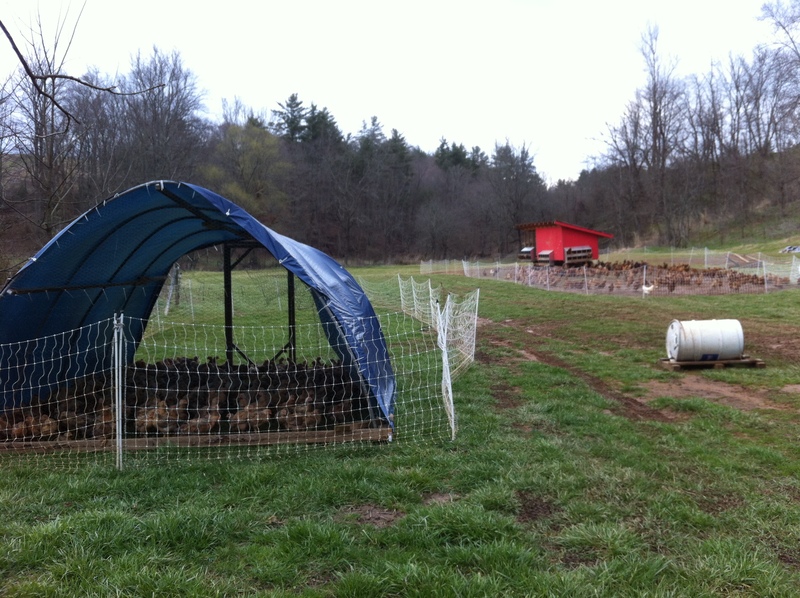 Check out our latest website post at dryridgefarm.org . 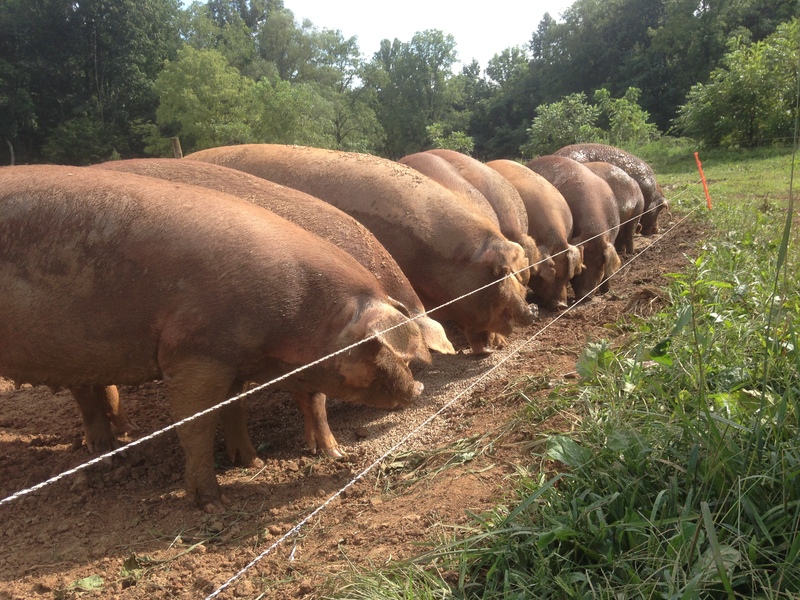 We’re different from most pasture-raised pork farms in this area in two main ways: we have a purebred herd of heritage Hereford hogs, and we breed and raise our own pigs. We chose Hereford, not only because they’re beautiful pigs, but because they’re on the American Livestock Breeds Conservancy conservation priority list. 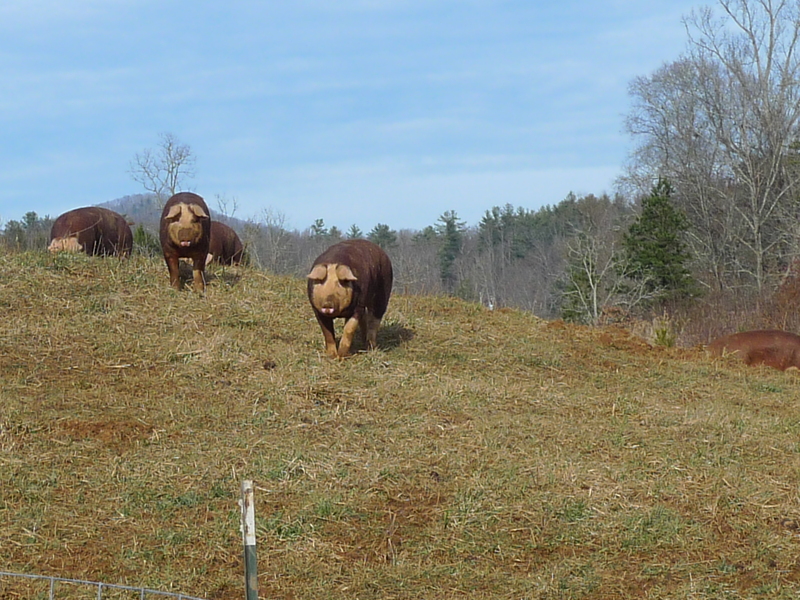 They’re a heritage hog, developed in the U.S. in the early 1900s, and there are only about 2,000 of them in the country! They do well on pasture, grow quickly, have just the right mix of fat to lean, and are excellent mothers, a trait that many other breeds lack. Breeding them on our farm allows us to know exactly how our animals are treated starting at birth. 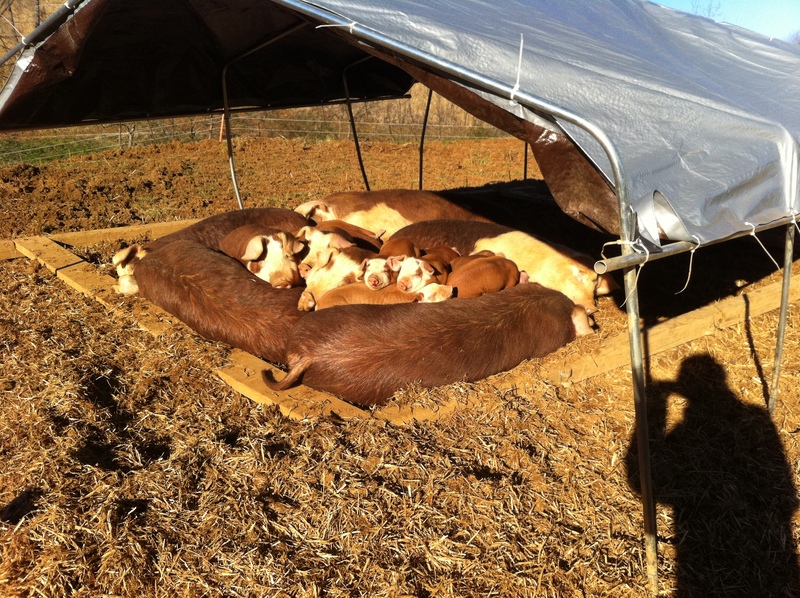 Our piglets are certainly happy to be on grass with their moms and our sows get to make their own nests in their farrowing huts, to which they come and go as they please. 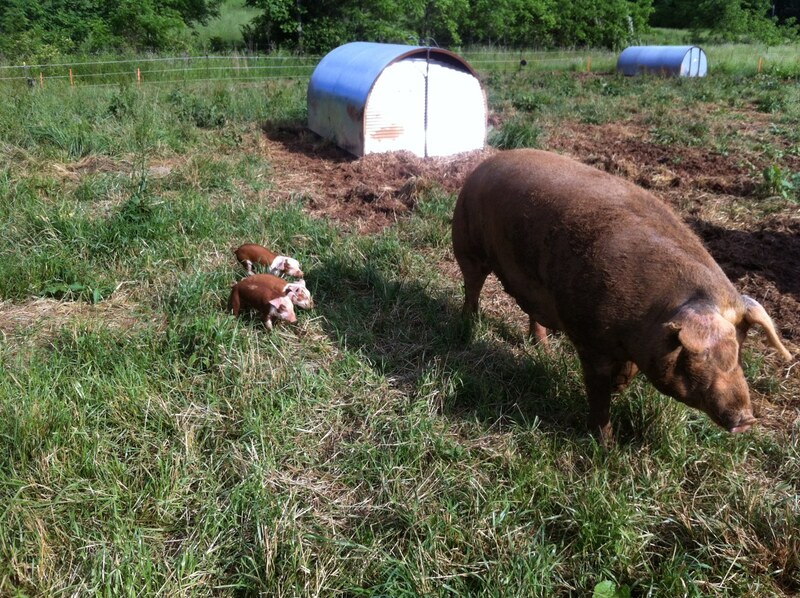 Plus, it’s just fun having itty-bitty piglets running around and watching momma care for them! Our sows and boar are the only animals on our farm with names. We started with three sows and a boar last February, and this year, in February, we added seven more gilts who will hopefully have litters, therefore becoming sows, in the next couple months. If you ever want to visit the farm to see what’s going on here for yourselves, you’ll get to meet Gertrude, Celeste, Clementine (who’s more orange than red), Valentina, and Jack… and get to brainstorm name ideas for the five girls we have yet to name. 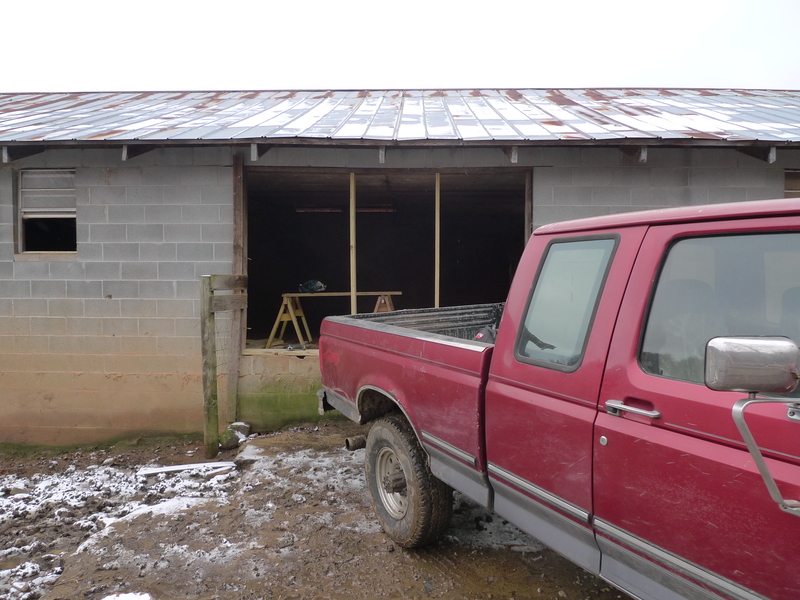 New Boar, Surprise Lambs, Stolen Truck… you know, the usual. That’s what I imagine the guy said when he saw our trailer, loaded down with our brand new hog huts, and at the time, connected to our truck, parked in the lot this guy happened to pass through. And I imagine that was the only thing on his mind (and $$ signs in his eyes) when, in broad daylight, he smashed the window, pulled out the ignition column, revved it up and drove the whole rig out of the lot. Lucky for us, a) scrap yards tend to be closed on Sundays, and b) most opportunistic thieves often aren’t thinking crystal clearly. And so, after meeting with the police, Graham and his buddy drove around the neighborhood and spotted the “hidden” truck (without trailer) in a lot ten blocks from where it was stolen. 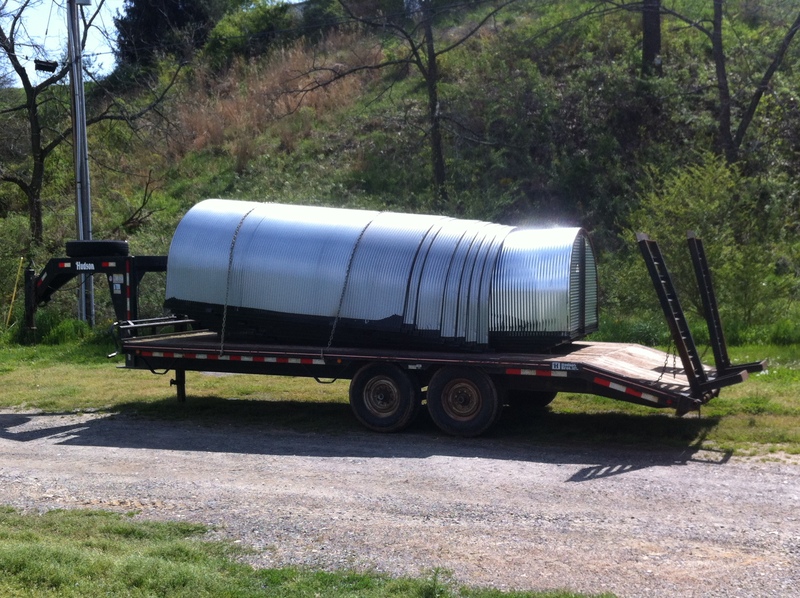 When the cops arrived, they found the trailer unhitched behind some tractor-trailers, hog huts and all. And we consider ourselves crazy lucky. Photo quality isn’t great: Sorry; it was pouring down rain. That’s why they look a little glum. They’re also brand spanking new in these pictures… not even totally cleaned off yet. Lambs certainly aren’t that bad a surprise! She’s a young mom, but not crazily so, and we’re lucky that she’s a good one: attentive and able to keep track of them in all the tall grass we’ve got! Babies and momma are doing well after their first week. Goodbye Marvin, Hello Jack! We got ourselves a new boar. He’s a bit prehistoric looking, but he’s a good-looking registered Hereford who’s proven. Why did we get him, you ask? Because Marvin wasn’t doing the one job he’s assigned to do (is it really so much to ask?). 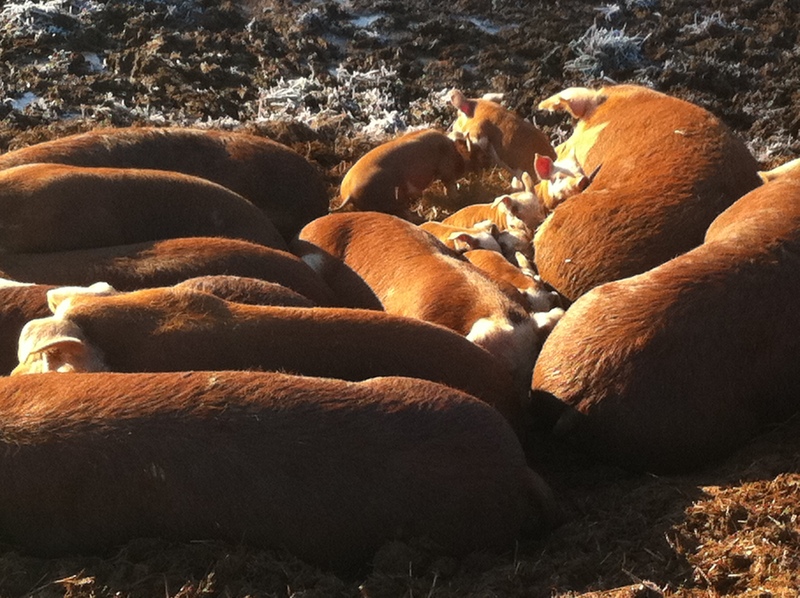 We had several gilts and sows come back into heat for two, even three, months in a row. Boars really aren’t supposed to “miss.” That, and he had arthritic back legs, even though he was only two years old. JACK – Not so pretty; high testosterone! We’re happy to report that Jack seems to be getting his job done without complaint! The ladies were a bit intimidated by him at first, but they’ve been going through phases of being head over heals in love… for three days at a time. He’s way more impressive and intimidating than Marvin was: good traits for a boar to have. 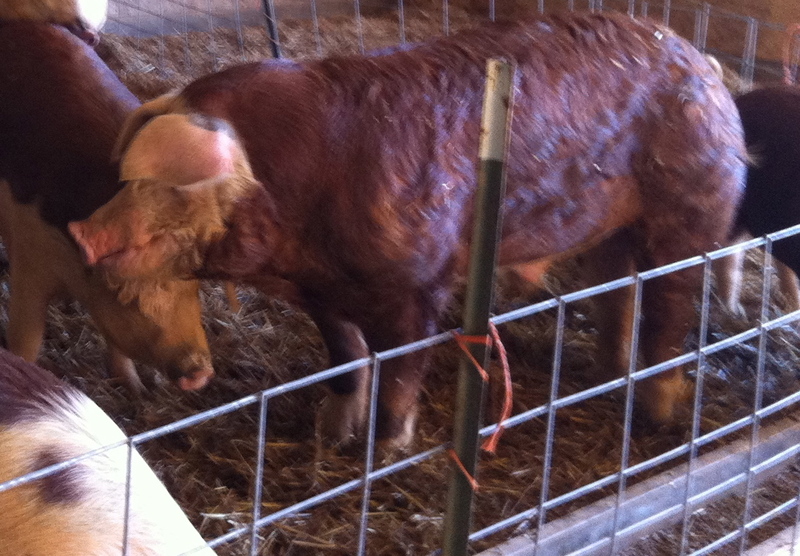 And now, we’re starting a new section of our farm updates, the Meet Your Meat Series. It seems appropriate for Part 1 to be about the product with which we started, and one that we just processed our first batch of the season last week! We raise all of our animals on pasture because we want them to be able to exhibit their natural behaviors so they’re happier and healthier animals. Our Red Broilers spend their first three weeks in our brooder before moving out to our pastures, spending their days in the sunshine, foraging for insects and worms and taking dust baths. We move them to fresh grass daily, which not only allows them to forage in brand new grass, but gives them the chance to eat the parasitic worms that could harm our sheep, while leaving behind just enough fertilizer to help our pastures thrive! 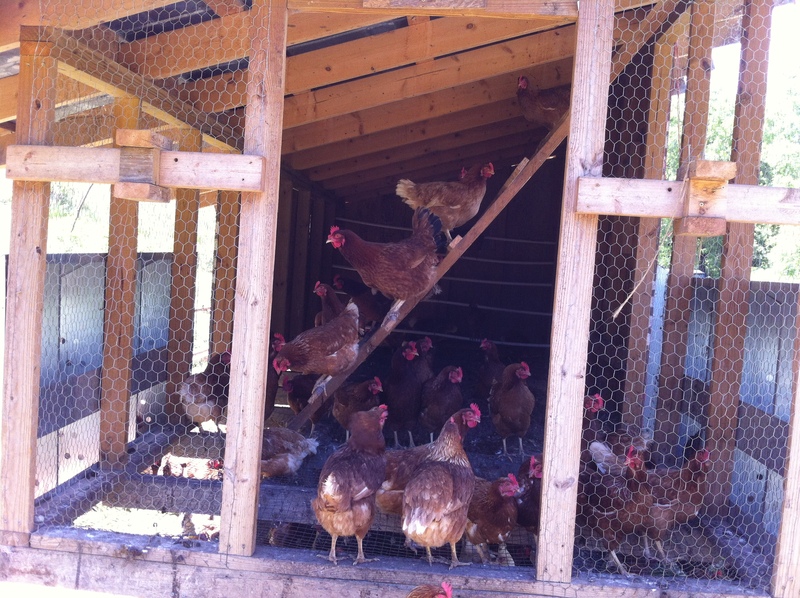 Unlike conventional birds, which are typically fed medicated feed from day 1, we never give our chickens any meds. We know that a bird that’s well fed and watered and living in a clean environment, shouldn’t get sick. In fact, we’ve only had one sick chicken in the two years we’ve raised them! We’ve lost some to predators and smothering when it’s cold, but only one to illness! So, you can rest assured that you’re eating an all-natural, healthy product: a bird that had a happy life, while improving our pastures’ health by doing what it does best, being a chicken. Why Red Broilers, over other breeds of meat birds? Primarily, because they have the best flavor and texture, but there are reasons for that! 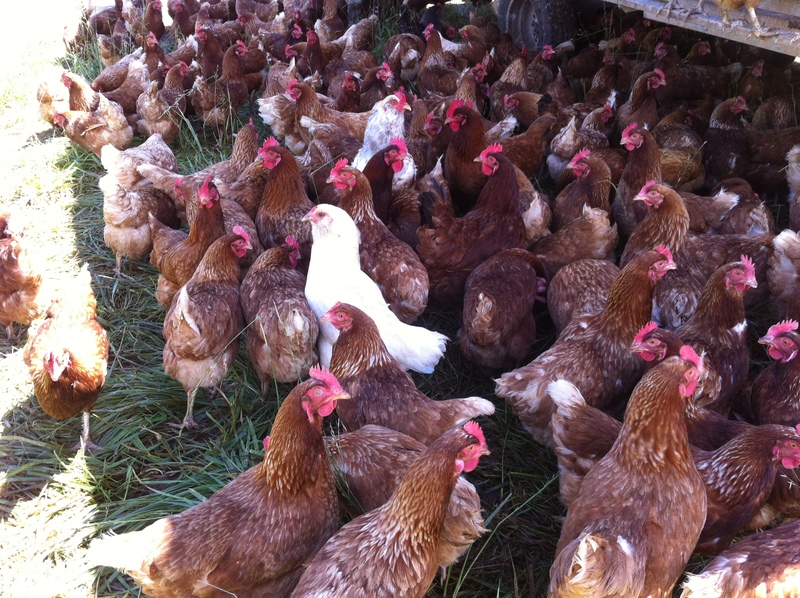 Red Broilers were developed in the 1960’s as ideal chickens for pasturing. The most popular meat bird, the Cornish-Plymouth Rock Cross, was developed for its very rapid growth rate; conventionally raised Cornish Crosses can reach a market weight of 4-5 pounds in as little as five weeks, which, while good for mass production, leads to skeletal problems, lameness, and low muscular development, which we think accounts for the decreased flavor in their meat. Our Red Broilers, on the other hand, grow more slowly, reaching market weight after 9 to 11 weeks, which is less taxing on their bodies, and allows them to be more active. Animal welfare is our #1 objective at Dry Ridge Farm; we’re proud of the way our animals live out their lives here, and we think you’ll notice how a healthy, active life improves the flavor and texture of all of our products! On my drive down to the processor this morning to pick up pork and lamb, I found myself completely mesmerized by my surroundings. Even on the highway, I was surrounded by green and pink: the green budding leaves on all the trees and the pink buds of the pear and cherry trees. What blew my mind is this: I drove the same route on Monday this week to deliver those hogs and sheep, and I hadn’t noticed any green. Spring seems to have leapt out of hiding this year, and started battling Winter’s dreary wet “reign” (I know, I couldn’t help myself) with all her force. 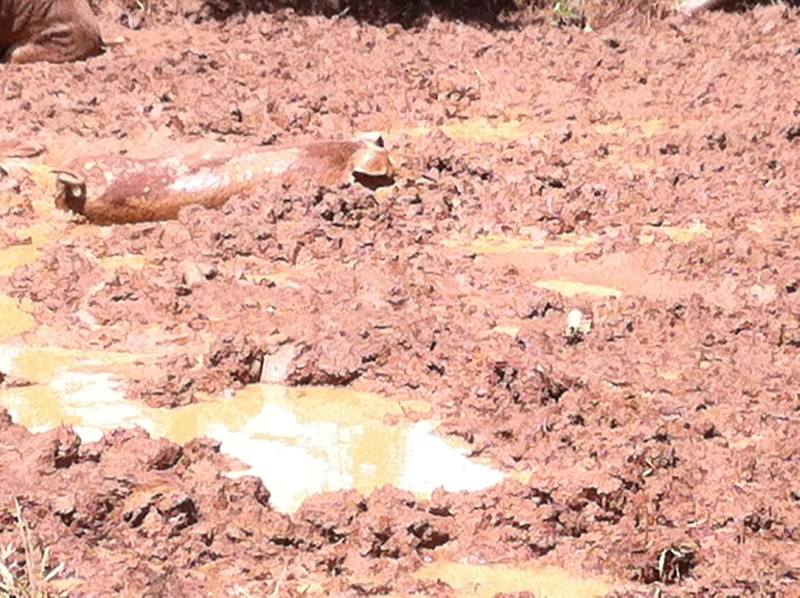 The mud is finally turning to grass and we, and our animals, are absolutely delighted! 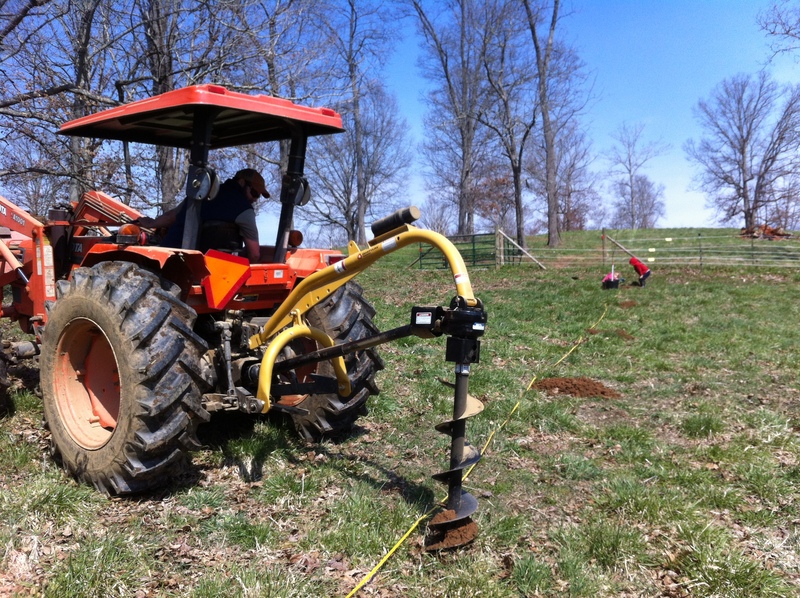 With Spring’s arrival, of course, comes a lot of preparation for the nice weather and a lot of changes on the farm. As I write, Graham is out in last year’s hog pastures seeding grass before tonight’s forecast of rain, after which he’ll go back to the garden, which he plowed yesterday, to disk it today and till a row for me to direct seed some lettuces. It’s all happening today because it might be too wet to do it tomorrow! 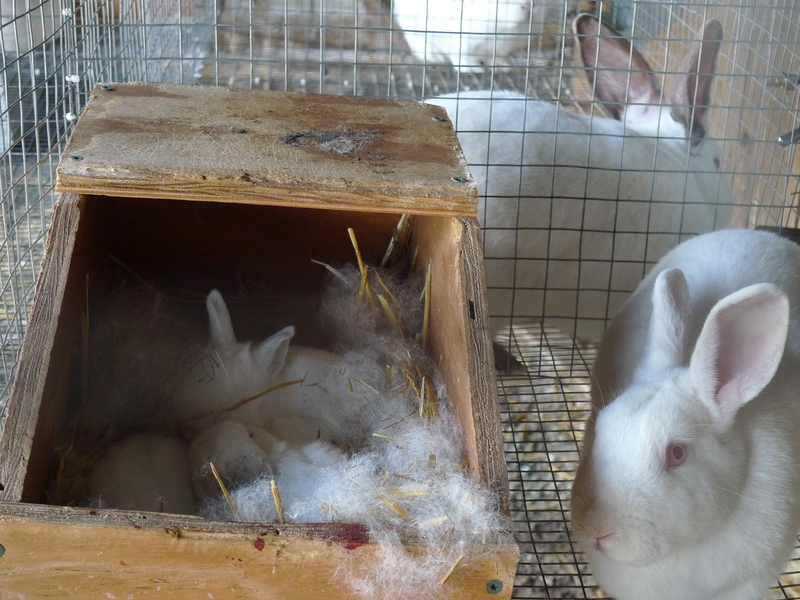 As for me, after writing this, I’ll get nest boxes ready for our rabbits who all should have babies in about 3 days. 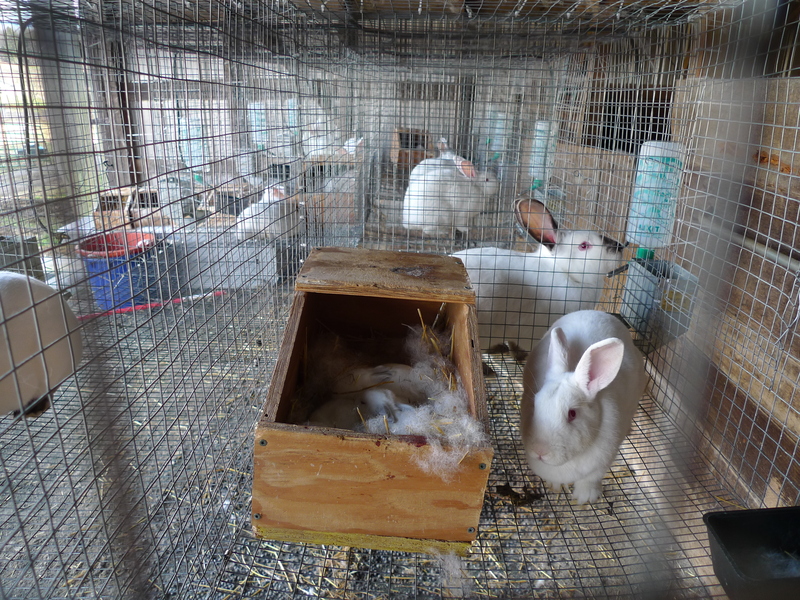 We have 42 rabbits from the last batch that will be available at market in late May! And then, I’ll help Graham with chores, which have gotten much more time consuming these days as we rotate two sets of sheep (ewes and lambs) through our pastures every two to three days and move our laying hens and first group of meat chickens around the chicken field. I’ll illustrate what else goes on during Spring from here on, but first, I want to point out that you should all check out our “where to buy” page for an updated list of our summer markets and our “Join our CSA” page to learn more about (and join!) our first CSA program! Very cold and wet pigs! So, we moved them into our big sand floored barn (that wall has two huge windows that open up too), where they’re in large groups, can root, and most importantly, be dry and happy and stop doing so much damage to our sopping wet pastures! 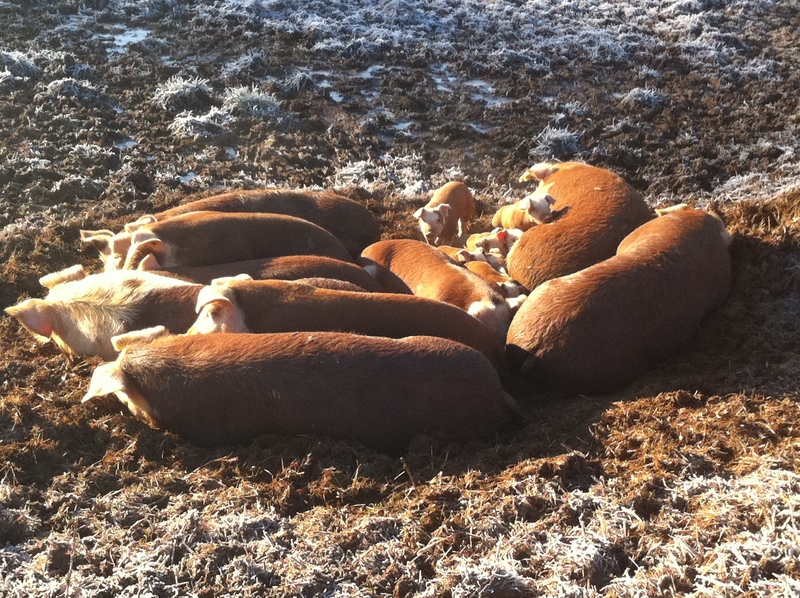 Ever seen a pig nest?! I hadn’t until last Spring. Pretty awesome huh?! 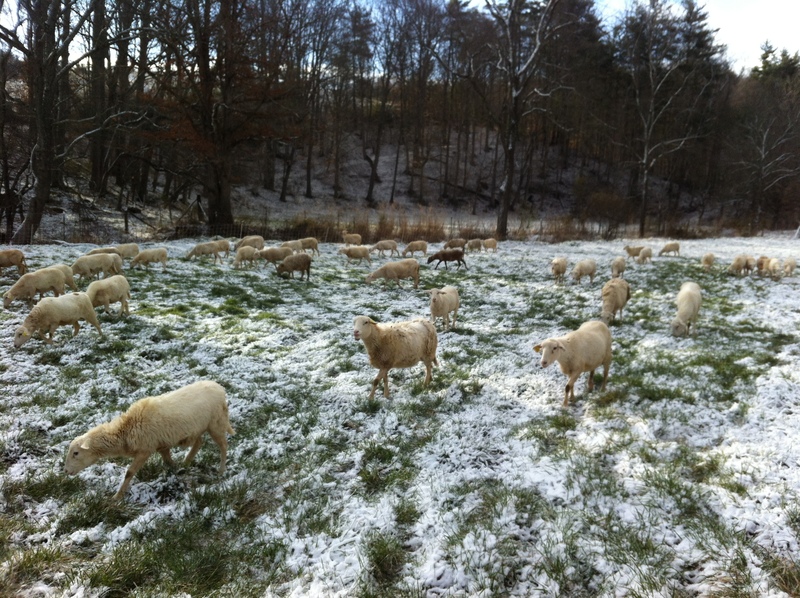 Moved our sheep off hay and rotating through pastures three weeks ago… and it snowed. Got our rotational grazing techniques in order. Moved old nest boxes out of the egg mobile and put new ones on the sides. So our girls have lots of space! 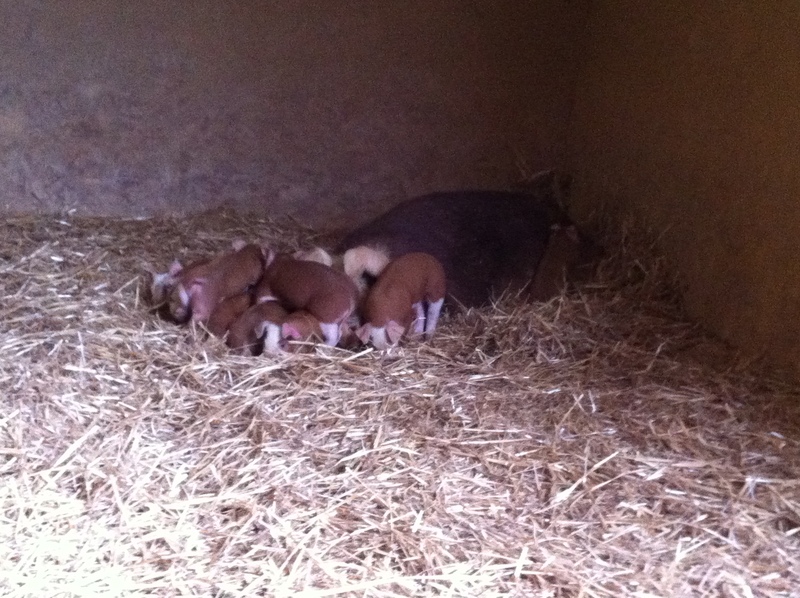 And really cute, happy piglets. One of 12. Now, come visit us at market and join our CSA, yo! It’s been raining for what seems like a month, with a couple days this past weekend of sunshine and seventy degree weather. Four days later, we’re bracing for nights in the teens and 20s, but we are THRILLED to have some sunshine in our lives! 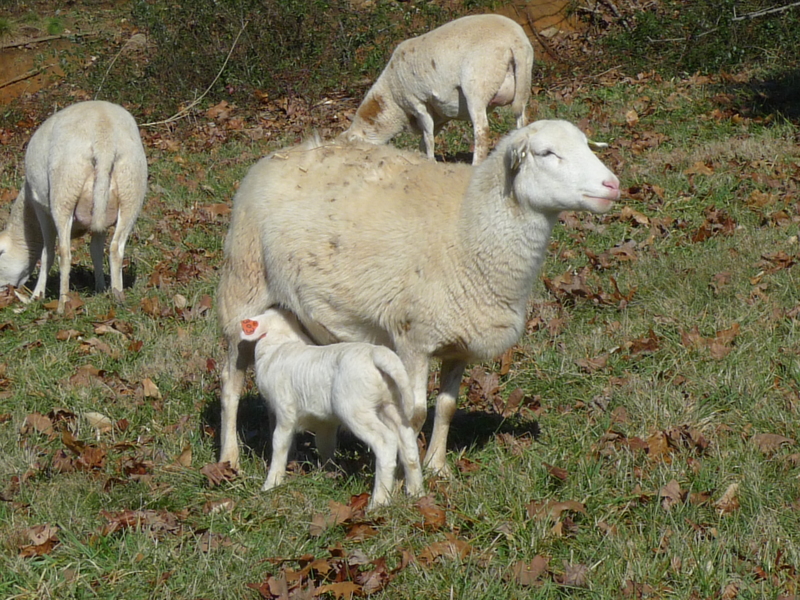 Since January 7th, our ewes have been hard at work having and keeping track of their babies! 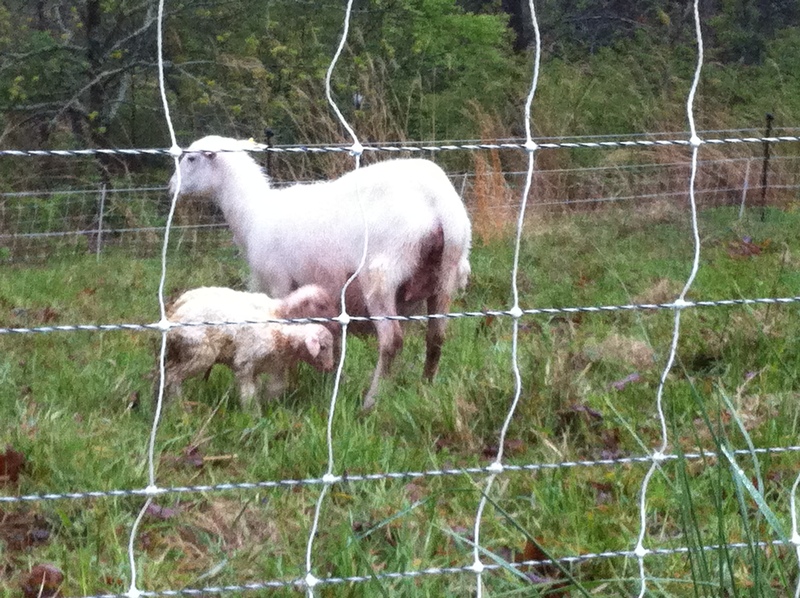 We now have about 40 lambs, with fourteen more ewes to go. Lambing with 38 ewes, instead of the 22 with which we started, and in winter this time, has certainly been more work, but things are going well so far (knock on wood). 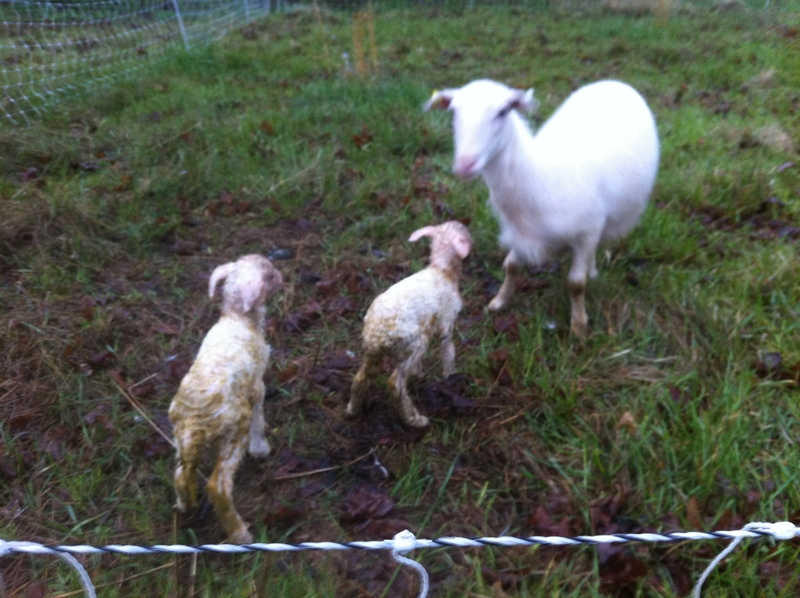 We’ve also had several firsts… our first set of triplets (now, we’ve had three sets of triplets) and our first assisted deliveries (lambs are supposed to come out like their diving, front legs and head first; we had one that had one leg backward and another that was just a little too hesitant to come out). We also had our first case of theft when one of our pregnant ewes, hormones raging, tricked us into thinking she’d had a baby, when really she’d stolen a twin. 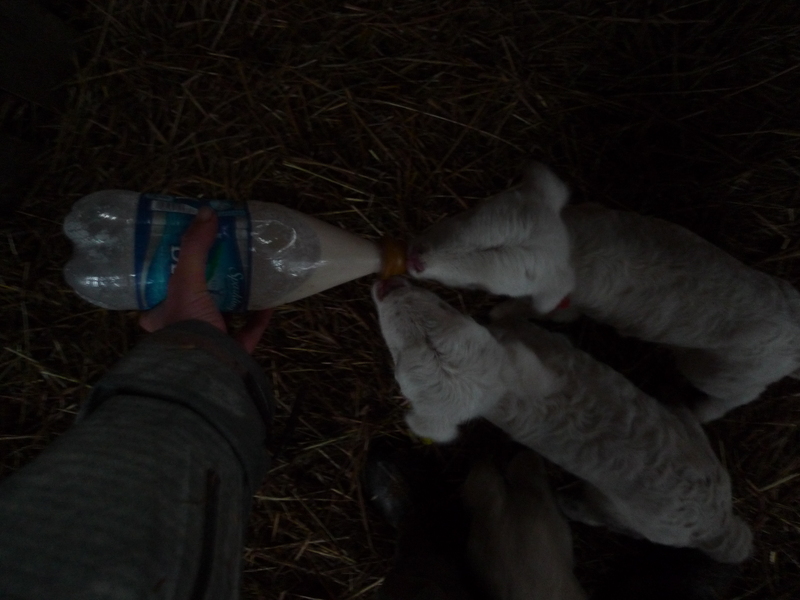 Unfortunately, she hadn’t developed her udder yet, so we ended up with a bottle baby. 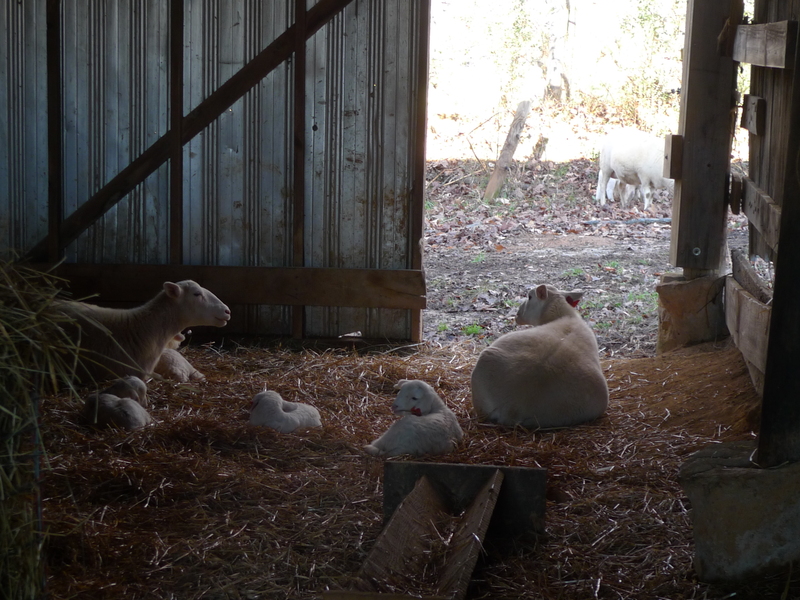 We also had one confusing morning, the day after Graham’s birthday, when we opened the barn to find eight lambs and four ewes who just couldn’t tell which lamb belonged where. 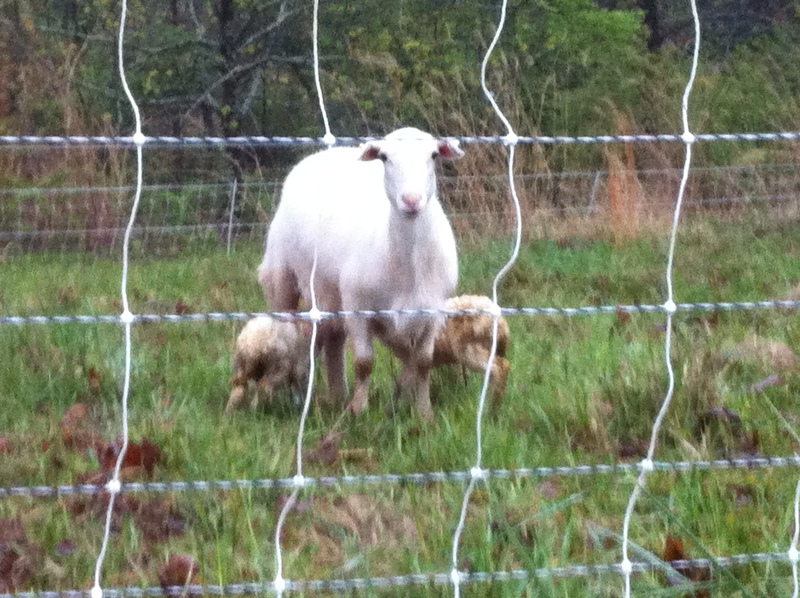 They each accepted one, but then another ewe adopted two of the abandoned lambs right before having twins of her own. She’s kept three of them and all are doing well! 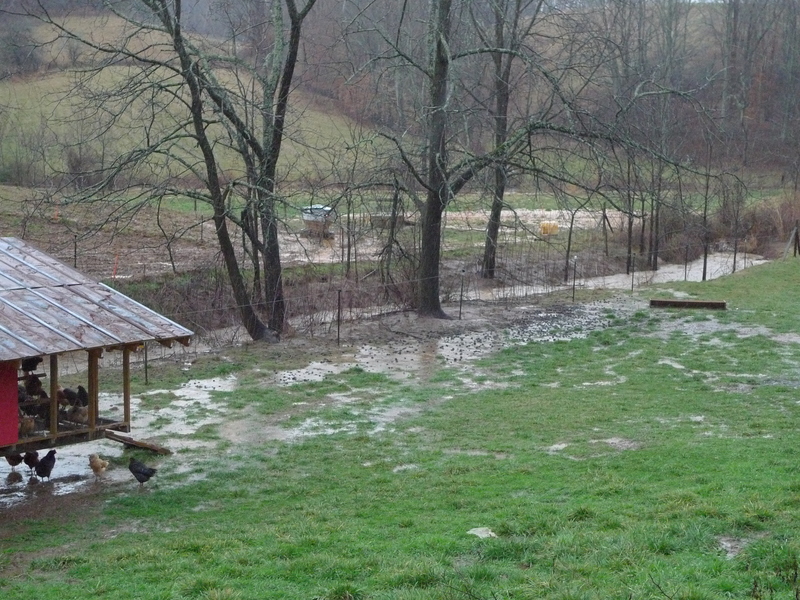 This creek’s usually about a foot wide wide. That pipe’s a three-footer. A Busy Week & Our First Press! We just wanted to do a quick post to let you know of a couple articles about the farm and to update you on goings-on this week. Thanks to Bryan Sullivan for writing us up for the Carolina-Virginia Farmer, and to Adam Hayes for hooking us up generally. Adam, of Red Stag, got us in touch with Bryan for this article and for the lamb class we presented to AND he’s to thank for our excellent farm feature dinner last weekend! 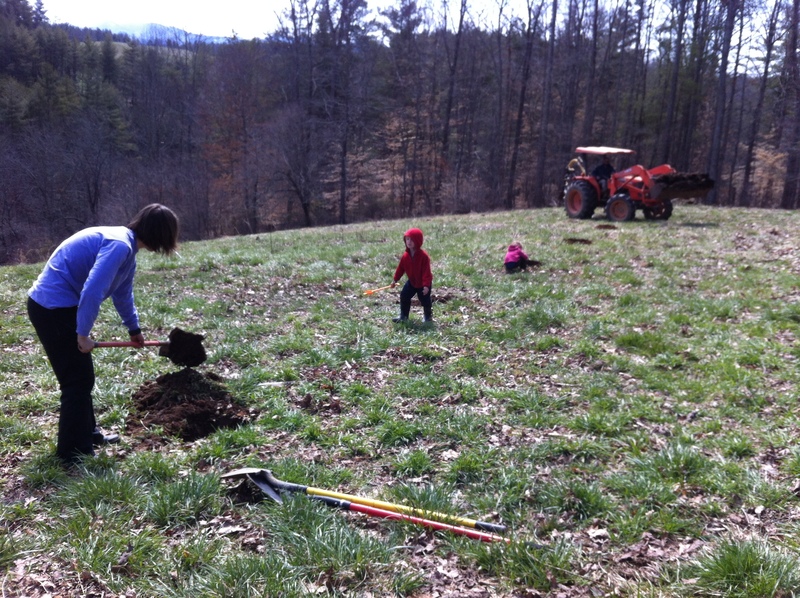 At the end of this post is the text from an Asheville Citizen Times article about the Future Farmers of America (FFA) lamb class to which we presented. 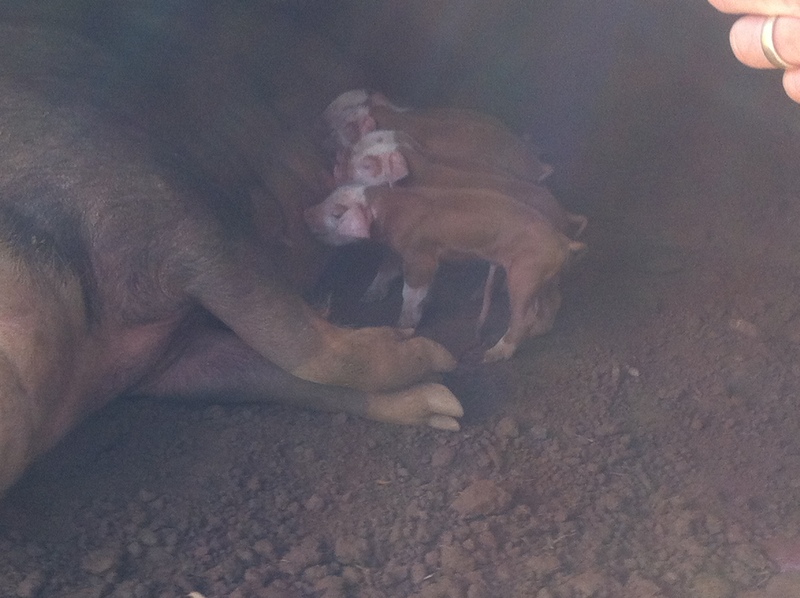 We had more piglets on Saturday, December 30th! 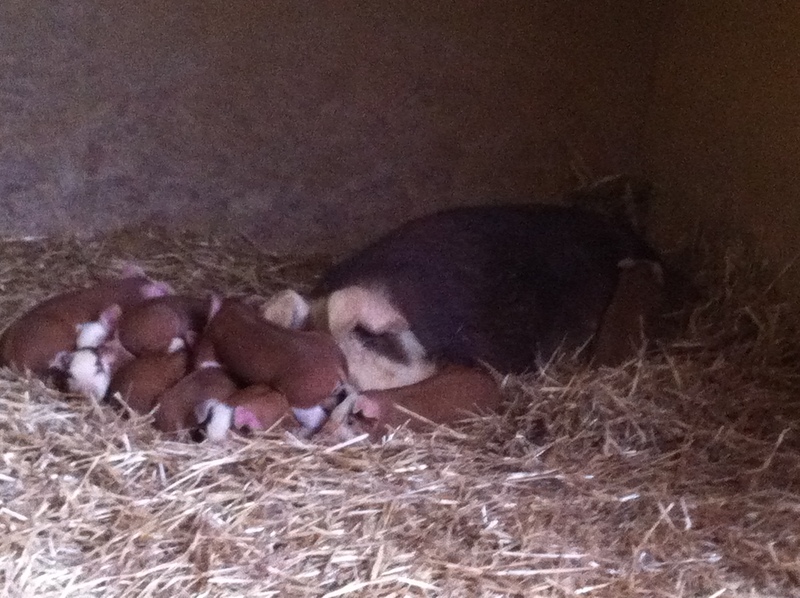 She had 13, lost 3 in the first few hours, but we still have ten piglets, which makes us very happy! She’s an excellent mother, and it’s been fun to watch how careful she is with the little ones. 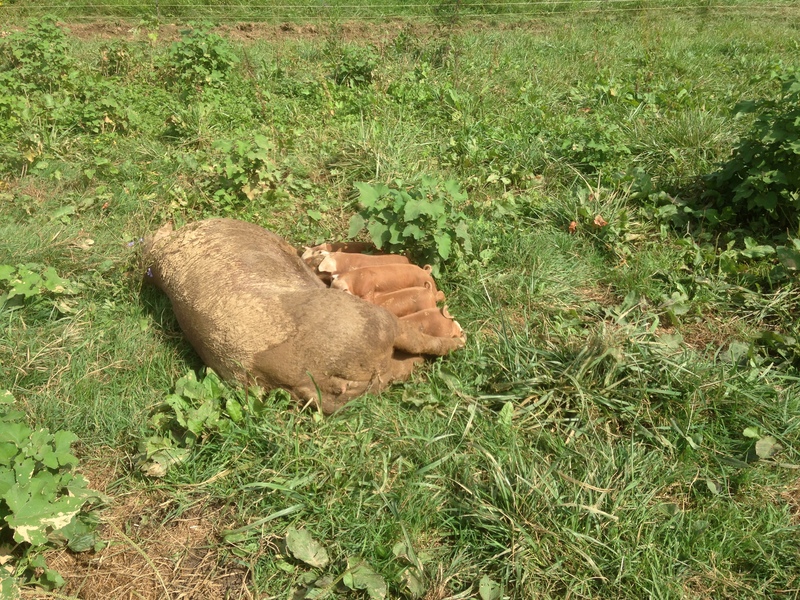 Often, the piglets are bundled on one side of the farrowing stall, and momma will dig a little trench next to them, lay down on the opposite side of it, then push them into the trench where they can snuggle up to her and eat. Animal mothers are truly fascinating to watch. Pig pile! A good way to stay warm. 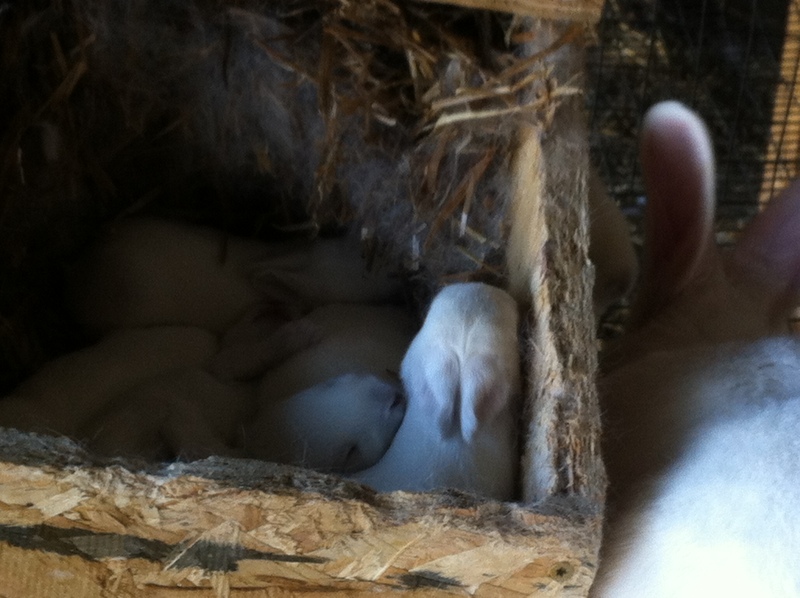 We also had baby rabbits! 21 of them this time. Our numbers are getting better on bits! 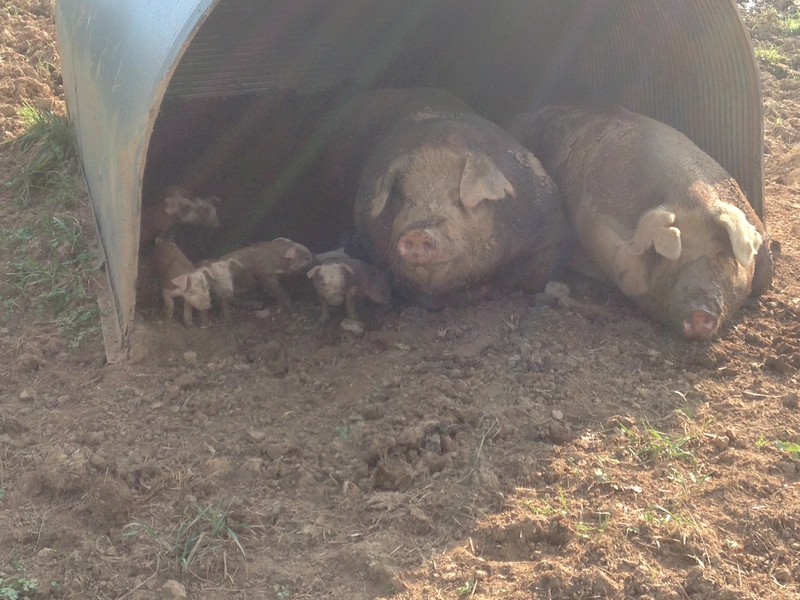 We moved the growing hogs into a new field, where they seriously bounced for joy at all the new grass and the straw! Moving the new home to the field. 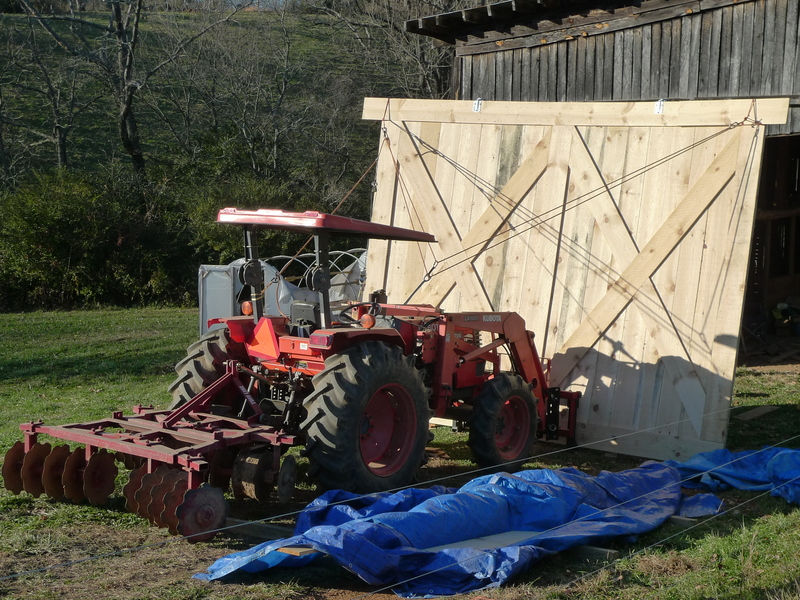 And turned the growing hogs’ old barn into a laying hen barn, with new doors and roosts. 400 new layers moved in on Saturday night… in the midst of some serious wintery weather. 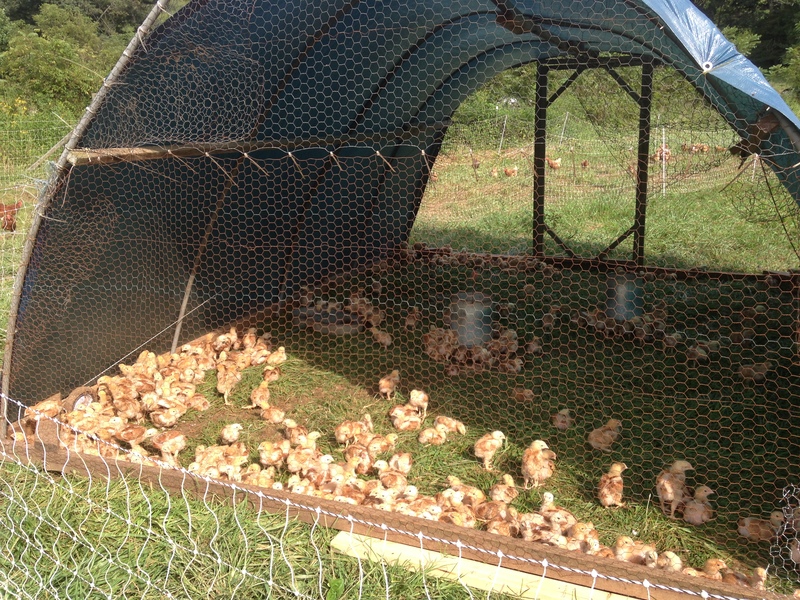 We got pullets this time, which are about 5 months old, so just starting to lay. We let them outside for the first time yesterday… and they’re getting used to feeling outdoor grass and sunshine for the first time in their lives! 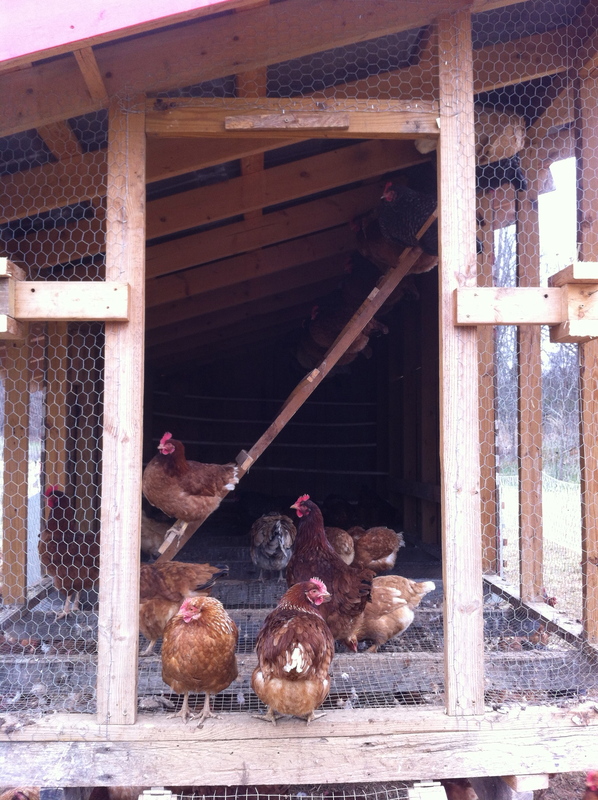 Doors completed, roosts and feed hangers added, and girls moved in! Their first taste of the great outdoors! That about sums it up. Happy holidays and happy New Year to all! At least that’s what the sticker he was wearing Wednesday said, as he led a special lamb butchery lesson for the students of North Buncombe High School. About 40 students from cooking and agriculture classes at the school heard from local farmers about the lamb production process. They also watched a cooking demonstration by Hayes, executive chef at the Red Stag Grill for the Grand Bohemian Hotel in Asheville, in a presentation detailing the lamb’s journey from farm to table. 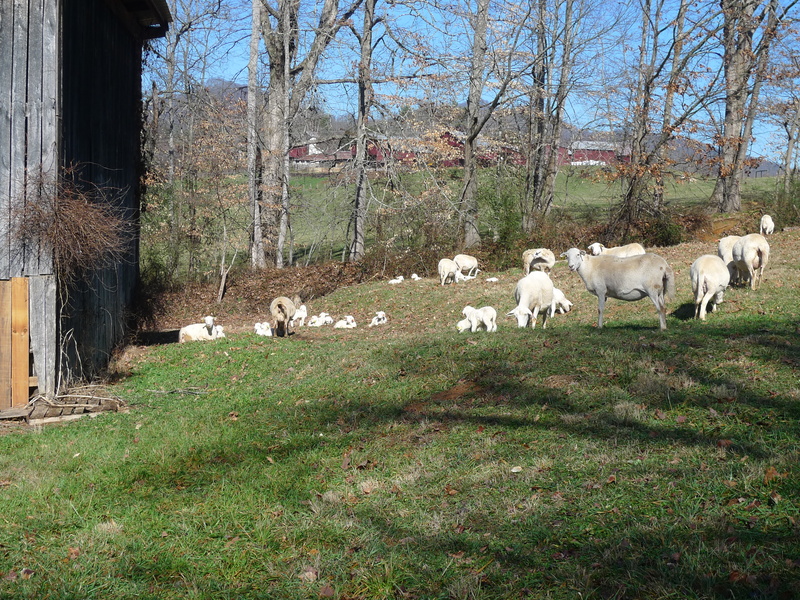 Wendy and Graham Brugh, of the new Dry Ridge Farm in Mars Hill, told students how they raise the lamb, what kind of work goes into small family farms and about the direct marketing process to local chefs and farmers’ markets. Hayes demonstrated how to prepare the different cuts of lamb meat, how chefs can be creative with the dishes and even served up samples of lamb entrees that go for $30 -$45 at the Red Stag Grill. Wendy Brugh told the classes about their decision to work with sheep and talked about the declining number of small family farms, especially among young people. “For us this was really a lifestyle choice,” Brugh told the class. “We both like working outdoors and working with animals, and we really enjoy the relationship building that comes with direct marketing the products,” she said. The presentation was organized by North Buncombe Future Farmers of America alumnus Bryan Sullivan, co-owner of Write Away Inc. editorial company, and a former chef himself. 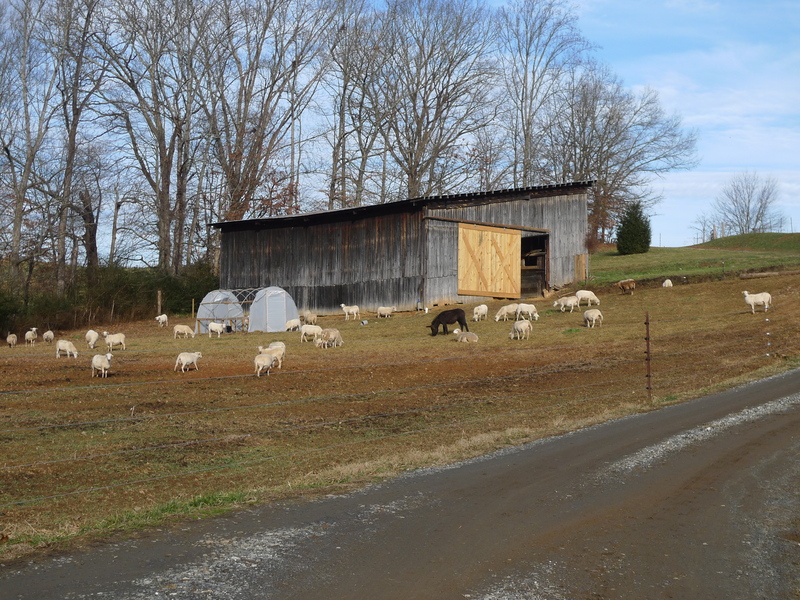 Sullivan was writing an article for Carolina-Virginia Farmer on a local chapter of FFA, and learned that while kids in one class at North Buncombe were learning about the basics of lamb production, they had little idea of what happens to the product once it leaves their hands. “The interest in helping these kids learn more about the overall business and marketing side of lamb farming was so well received by not only local groups, but regional and national participants as well,” Sullivan said. Sullivan lobbied The American Lamb Board, based in Denver, to donate reading materials, lamb-cut charts, posters, cookbooks and the stickers modeled by Hayes and got the Virginia-based Border Springs Farm to donate lamb for the class demonstration. “Honestly, this is what happens when you have a great alumni association,” agricultural education teacher Justin Gillespie said.